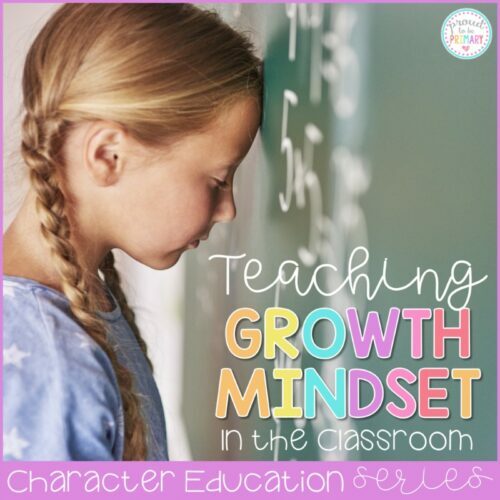 Whether you’re teaching K-2 or 3-5, you’ll find a wealth of information and resources for teaching growth mindset here. Try these growth mindset activities for elementary students today! Growth mindset activities are vital to elementary students’ social-emotional learning. As a teacher, you want your students to develop into well-rounded humans. This means they have both the intellectual and emotional skills needed to succeed in life. In order to make this happen, you’ll need to teach your students to have a growth mindset. A growth mindset helps students achieve difficult skills, helping them persevere despite difficulties. No matter how old your elementary students are, they need to learn how to develop a growth mindset. A growth mindset will help them achieve their educational goals for the year. 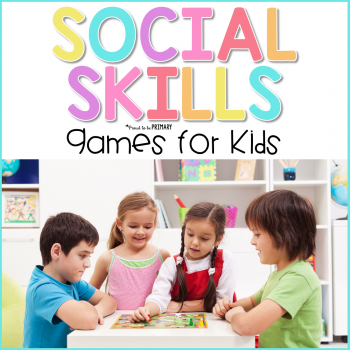 It will also help them in life as they work through difficult tasks and ideas. Here are growth mindset activities for elementary students that can help them build a strong outlook. 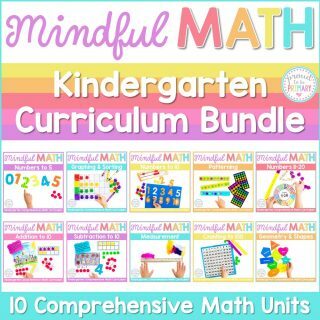 These activities will teach students in grades kindergarten through 2nd all about how to achieve a growth mindset. From practicing positive mantras to reading children’s books as examples, these activities will help change your students’ thought processes. 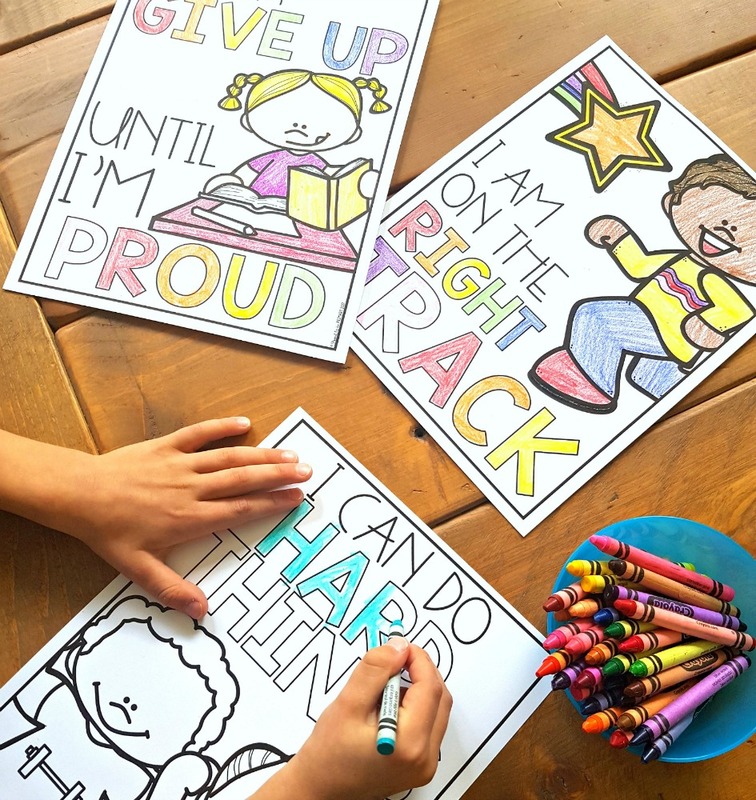 Growth Mindset Quote Posters – This activity set comes with coloring sheets your students will love, as well as mantras that will help them achieve a growth mindset. Grab a FREE sample HERE! 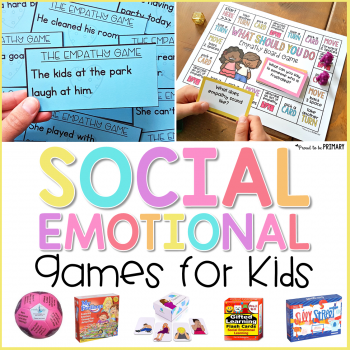 Self-Regulation, Self-Control & Self-Esteem Social Emotional Learning Curriculum – Increasing your students’ self-esteem will help them in their quest for a growth mindset! Try a student-led classroom – Stacking cups can be a great way to explain how students can support and lead their learning. 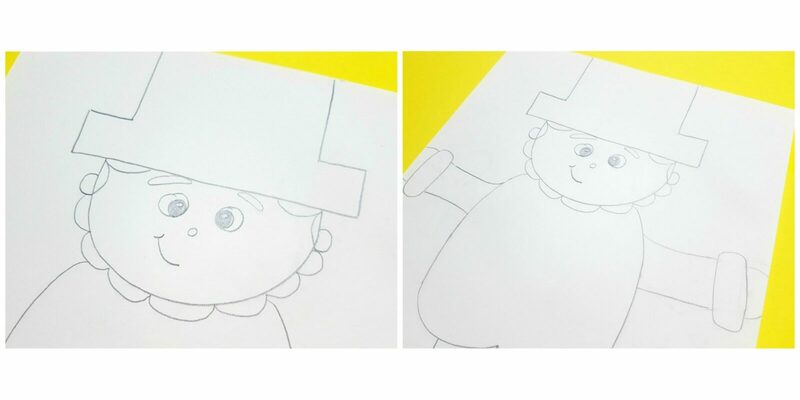 This activity is perfect for encouraging a growth mindset! Teach kids about the “power of yet” – To understand the “power of yet,” explain to students that sometimes things that are difficult take time to practice before succeeding. Remind them to have an attitude of “I can’t do this YET” but that one day soon, they WILL! Read the book Giraffes Can’t Dance, and perhaps use a graphic organizer to write down growth mindset take-aways from the book. Encourage Determination – The book, The Little Linebacker is a great book to teach your students about determination and to never give up! Highlight thoughts and feelings – Read The Girl Who Never Made Mistakes and take some time after reading for discussion. While talking about the book, ask students what thoughts and feelings the main character, Beatrice, expressed that showed her growth mindset versus her fixed mindset. Have kids write and draw what they like about themselves – A strong self-esteem helps your students have a growth mindset. By writing/drawing positive affirmations about themselves, it reinforces a growth mindset. Encourage them to place their positive reminders in a place they see them every morning when they wake up. Older elementary students also need to learn how to have a growth mindset. As students get older, the skills they learn in school become more difficult. 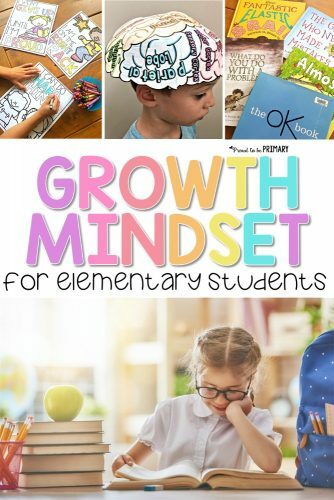 Because a growth mindset helps students persevere in the face of difficulties, these growth mindset activities are perfect for your classroom. 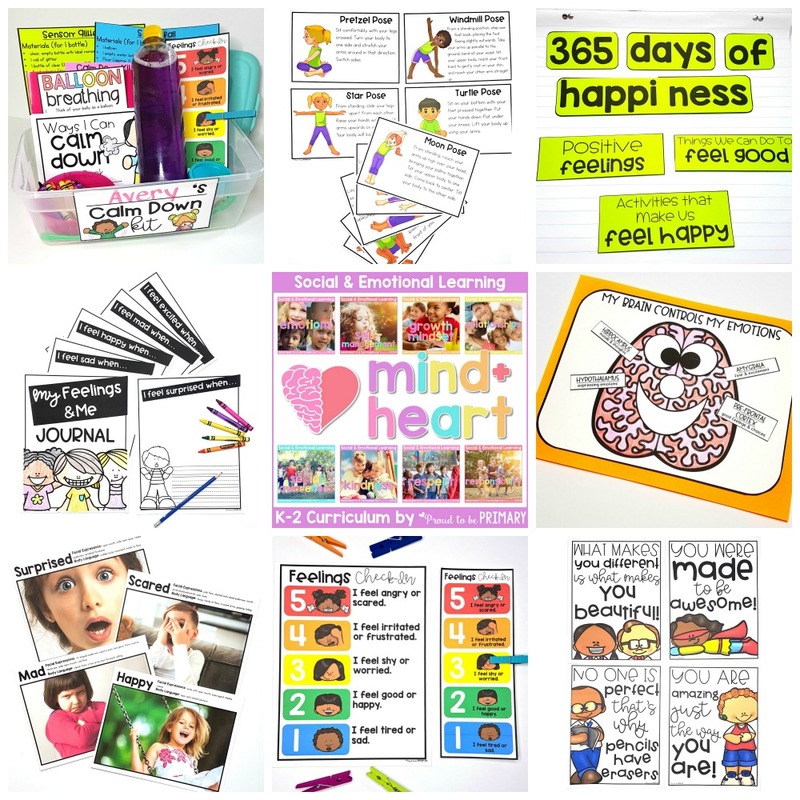 These activities include ideas such as learning about the brain and bullet journaling. Fixed vs. Growth Mindset – Sometimes, sorting thoughts and vocabulary is the easiest way to reinforce a concept. First, give your students the vocabulary needed to describe what a fixed mindset is vs. a growth mindset. Then, allow them the opportunity to sort those words either on their own paper. 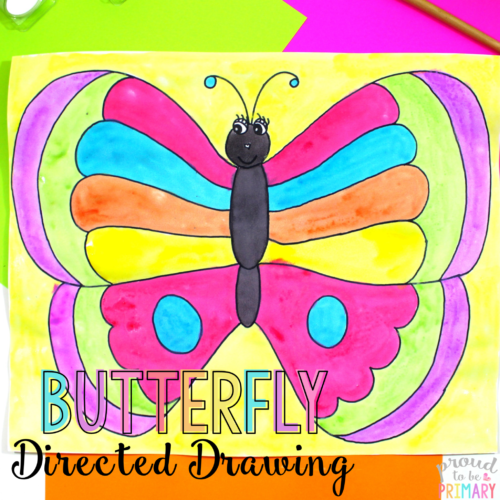 They can do it as a whole class on a visual chart, and/or in small group discussion. Create thought maps – You’ll be amazed by your students’ responses when you do this activity. In effect, it involves brainstorming what several growth mindset terms mean. Bullet journaling – Your students can use a bullet journal to cultivate a growth mindset! If you don’t know what a bullet journal is, it’s a free form of journaling. For example, it can include sketching, highlighting, coloring, and of course, bullet points. 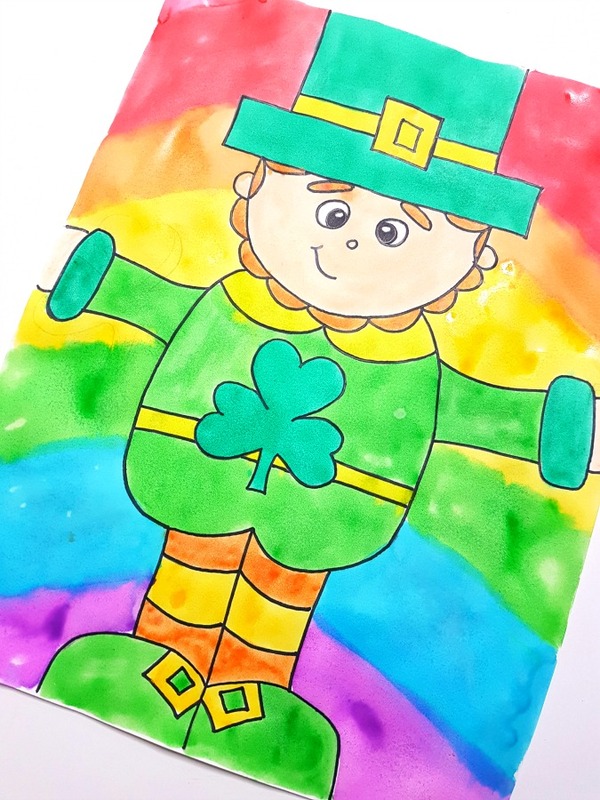 Kids usually enjoy the freedom to express themselves in journals. Also, they can be a great way to show their understanding. Talk about famous failures – Use inspiration from famous people who have failed to encourage your students to develop a growth mindset. 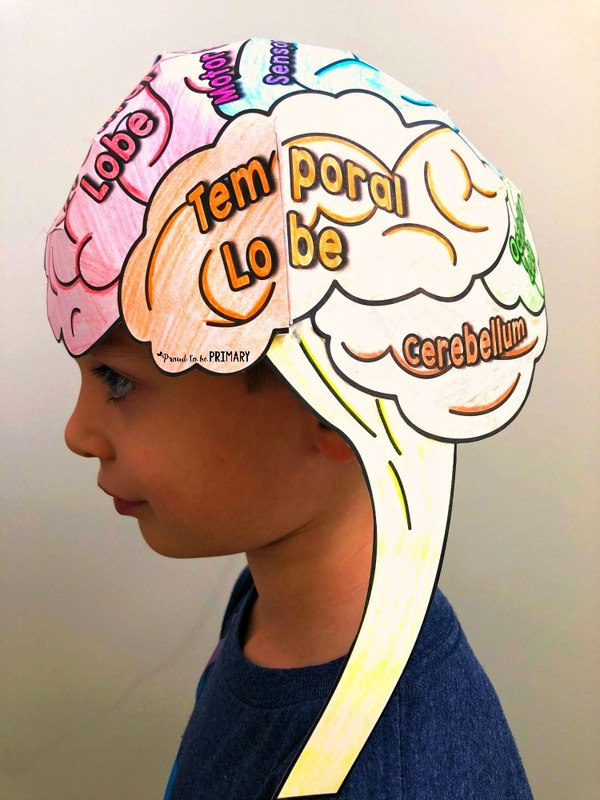 Teach about the brain – The brain is a fascinating subject! You don’t have to know much about brain anatomy to teach growth mindset. For example, give a simple explanation about how the brain has different parts that work together to control and organize our thoughts. Children will understand that our brain plays an important role in our thought processes and behaviors. S.M.A.R.T. goal setting – Encourage kids to strive for what they want to learn and set specific goals to keep them focused and on track. Setting SMART goals means that they are S-Specific, M-Measurable, A-Achievable, R-Relevant, T-Time Bound. 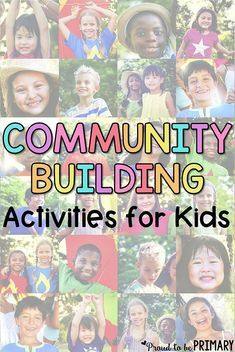 Regardless of what grade you teach, there are some activities that students of all ages can do. These growth mindset activities are perfect for students of all ages. 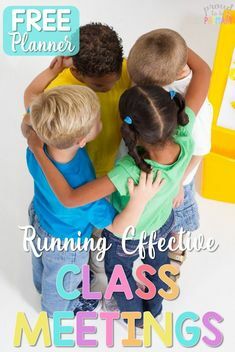 Students will show growth with these activities, such as role-playing, using new vocabulary, and reading literature to make connections. Teach the vocabulary – Talk about what the specific vocabulary is needed to describe what it feels like to have a growth mindset. A few examples of vocabulary words you might address are: perseverance, effort, mistakes, courage, risks, attitude, improve, challenge, and grit. Use a graphic organizer – You can use a graphic organizer or two to help your students discover more about a growth mindset. Some that might work are: thought/word maps, compare and contrast, Venn diagrams, fact vs. opinion charts, or tree charts. Inspire them with quotes – Try reading, verbally repeating, discussing, and writing inspirational quotes. It is a fun way for kids to learn about a growth mindset. Here are a few good examples. Say the word “yet” – Let your students hear you respond with the word “yet” when they say “I can’t ______.” Consequentially, this response can change their whole outlook. 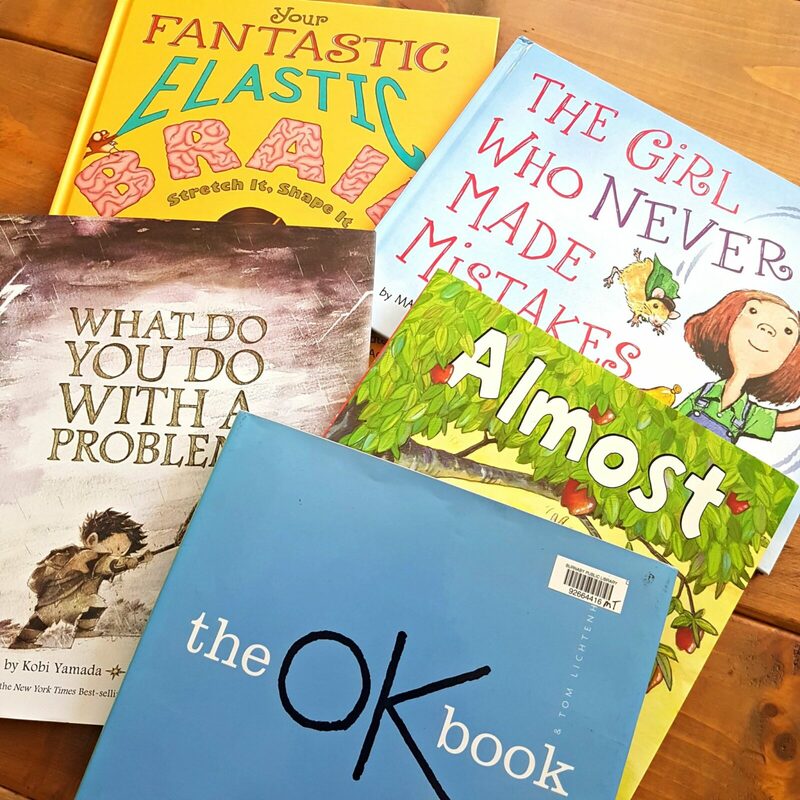 Using literature to guide discussions – There are so many great books that show great growth mindset examples! 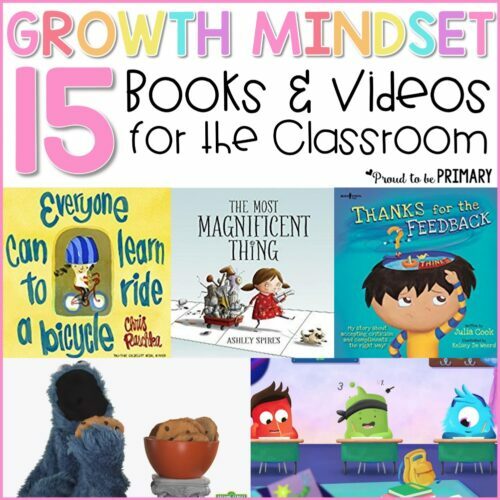 Pick any of these growth mindset books to give students a story example of having a growth mindset. For example, it will help them learn the concept in a thoughtful way. Then you can use the books to spur discussion. Role-playing scenarios – Give students task cards with scenarios on them to act out in small groups. This will lead to helpful discussions on topics about growth mindset. These growth mindset activities will help you teach your students all about a growth mindset. 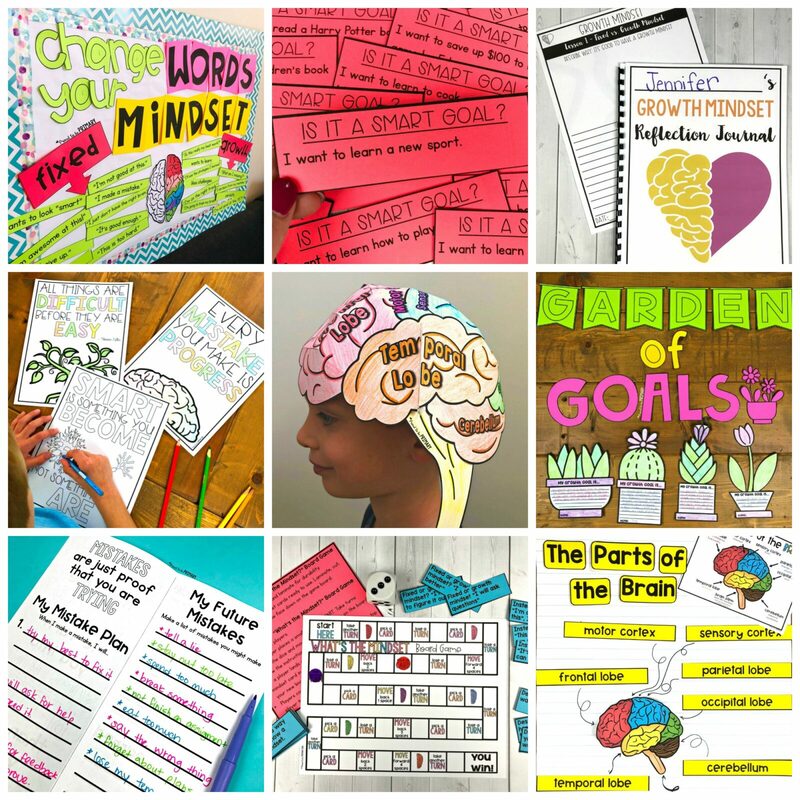 From coloring pages to journal ideas, you can teach your students why a growth mindset is important. Try using these growth mindset activities for elementary students. You’ll get the chance to see your students’ perspective on life change as the year progresses. 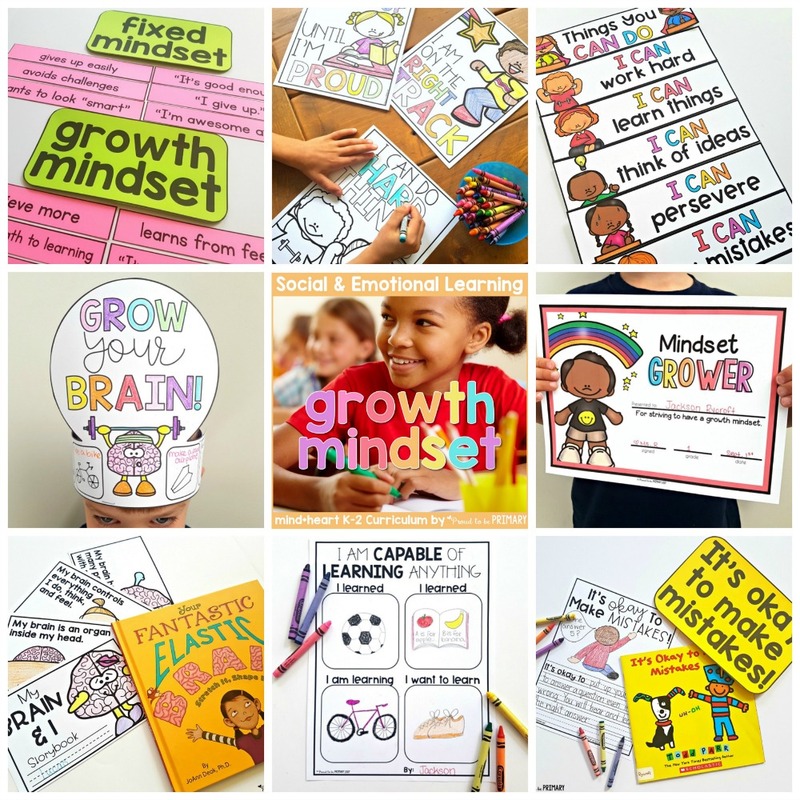 The complete growth mindset unit for K-2 includes tons of helpful lessons and activities to help children develop a growth mindset and “I can” attitude. Click here to see everything included. 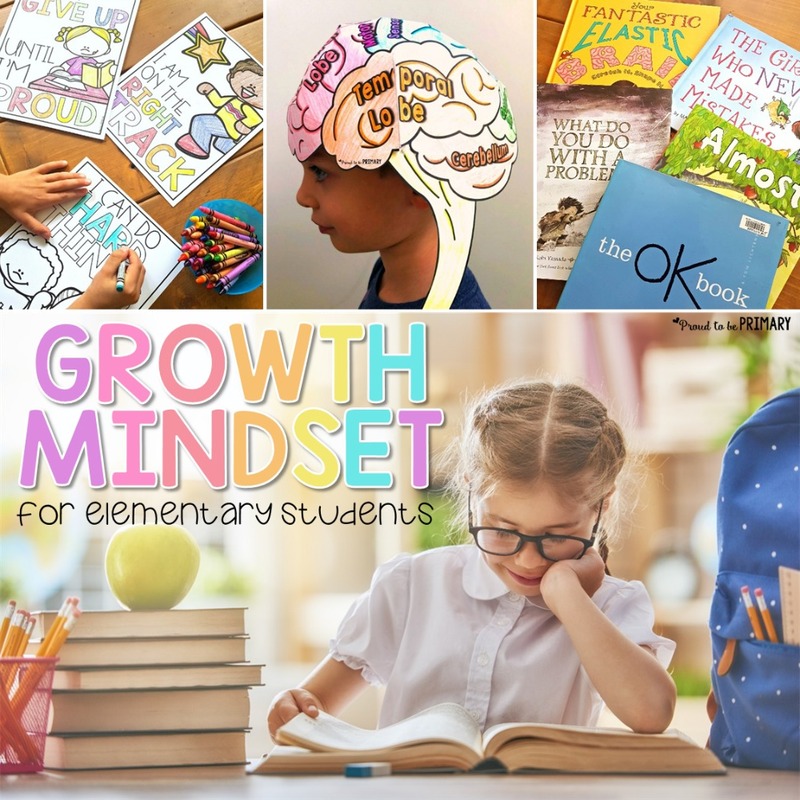 The complete growth mindset unit for 3-5 includes tons of helpful lessons and activities to help older kids build a growth mindset, learn about the parts of the brain, and how to set SMART goals. Click here to see everything included. 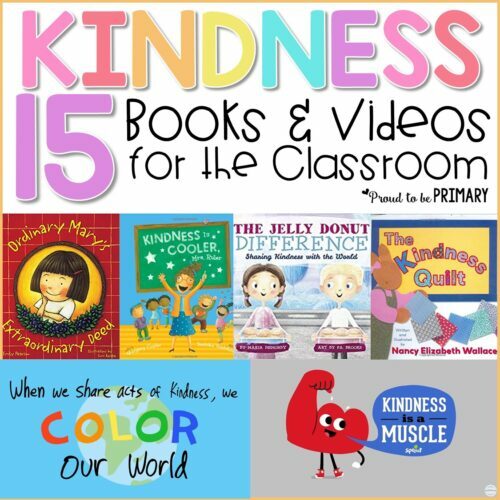 6 kindness activities for the classroom, including setting goals, random acts of kindness challenge, book ideas, and lesson suggestions. Kindness matters. It can turn a child’s whole day around. When you have children who are kind, the day is brighter and more productive too. How can we as teachers improve our kids’ behavior and attitudes towards each other and create a pleasant learning environment through teaching kindness? 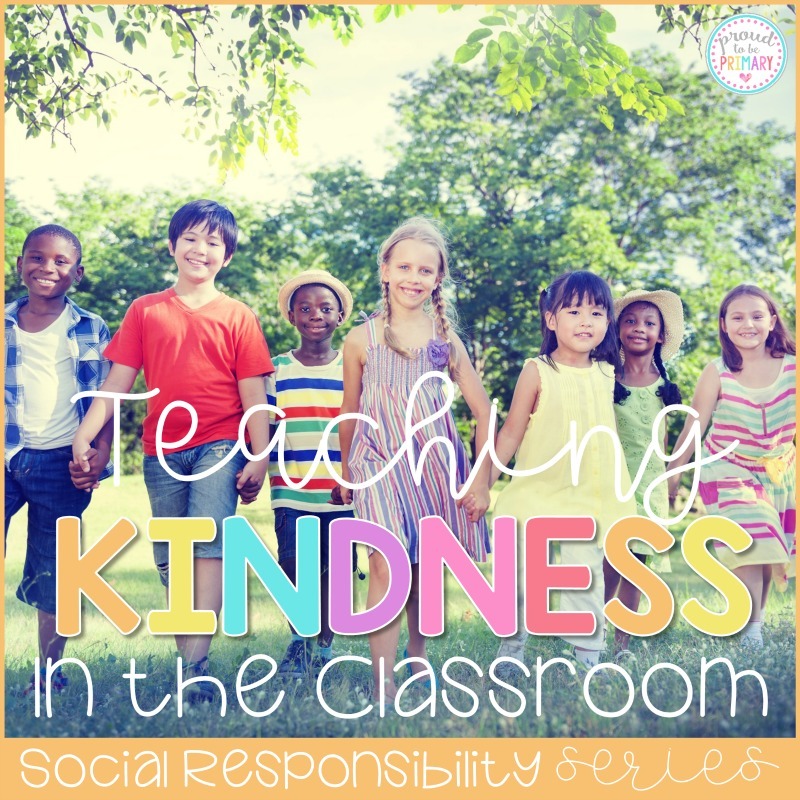 These 6 kindness activities for the classroom are so easy to implement. I just know you and your classroom students are going to love them. 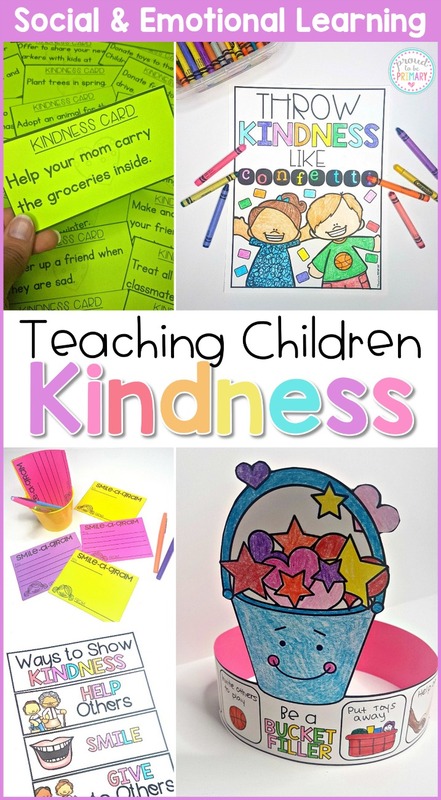 Kindness activities are just as important as teaching Math, Reading, and other subjects. 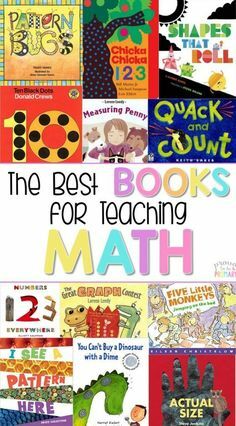 Kids learn from a multitude of methods how to behave as well as how to retain book information. The most important method of teaching anything in the classroom is almost always direct instruction. It’s also important to note that, unfortunately, some students aren’t seeing kindness in their homes, and haven’t been taught by example. So anytime you can take a moment to teach children how to treat others with kindness, you should seize the opportunity. In doing so, you’ll see an improvement not only in the classroom climate and student behavior but also your own morale. Anytime you are introducing a new concept to your class, you need to provide a basic understanding of it at the beginning. Some children may not have a conscious experience in giving or receiving acts of kindness, and you will want them to feel they can easily meet expectations. They may need you to provide clear examples of what kindness in the classroom looks like. One way is to activate prior knowledge by brainstorming ideas as a class. Large Group Brainstorming: One way to brainstorm as a class is to ask an open-ended question such as “What was something kind you saw someone do lately – big or small?” and jot down the responses on the whiteboard or chart paper. 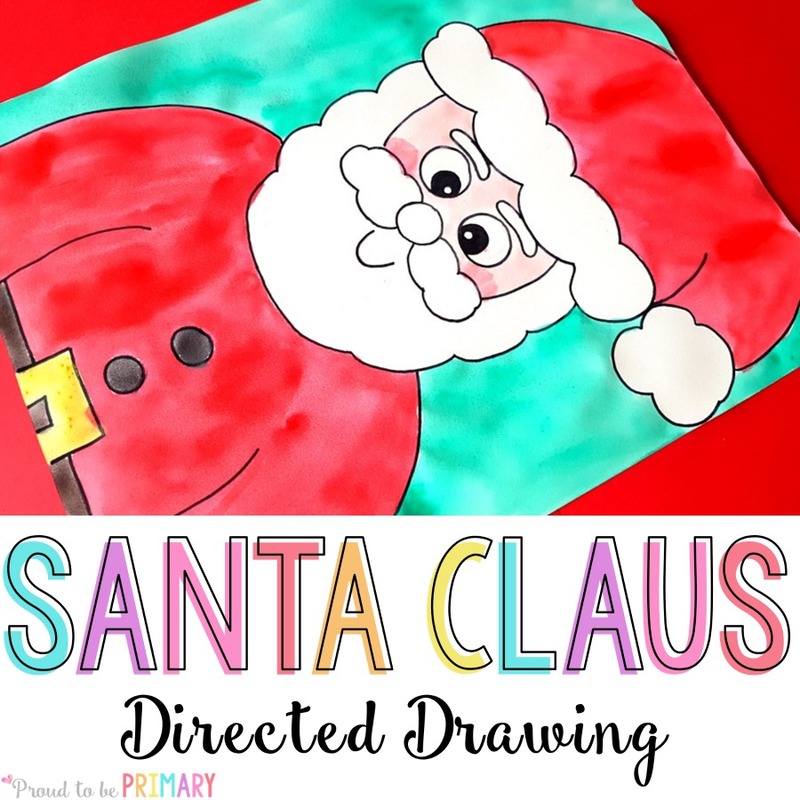 Two categories: Big Things and Small Things, so that the children can see that it doesn’t always have to be something big, but that small things count just as much! Independent Acknowledgement: Pass a notecard out to each child and have them write down something nice done for them lately, and how it made them feel. Collect them, and read them aloud for everyone to hear and understand how kindness makes the heart happy. Bucket filling is a system that encourages students to act independently to fill each other’s invisible buckets by doing kind acts. One of the simplest things to encourage students to do is to find opportunities to show each other kindness in random, unexpected ways. 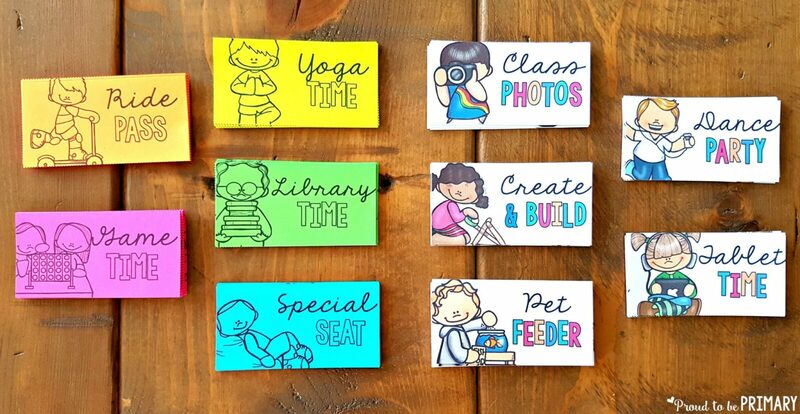 “Complimentary” Notes: Provide sticky notes in a noticeable spot in the classroom for students to take at any time (they’re “complimentary”!). 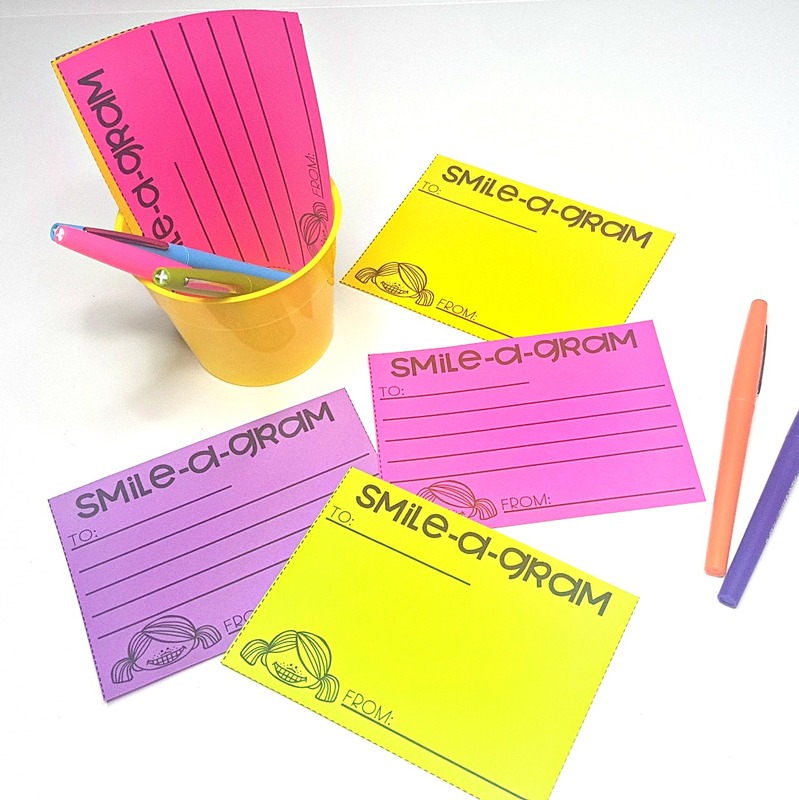 Students can use them to write a compliment or SMILE-a-GRAM to another student and stick it anonymously on someone’s desk when they’re not looking. Thank-you Notes: Have children think of people who have done something nice for them lately. Let them pick whom they want to say “Thank you”. It could be the lady who serves them lunch at the cafeteria, the bus driver who takes them to school every day, or the older sibling who helped them with their Math homework. 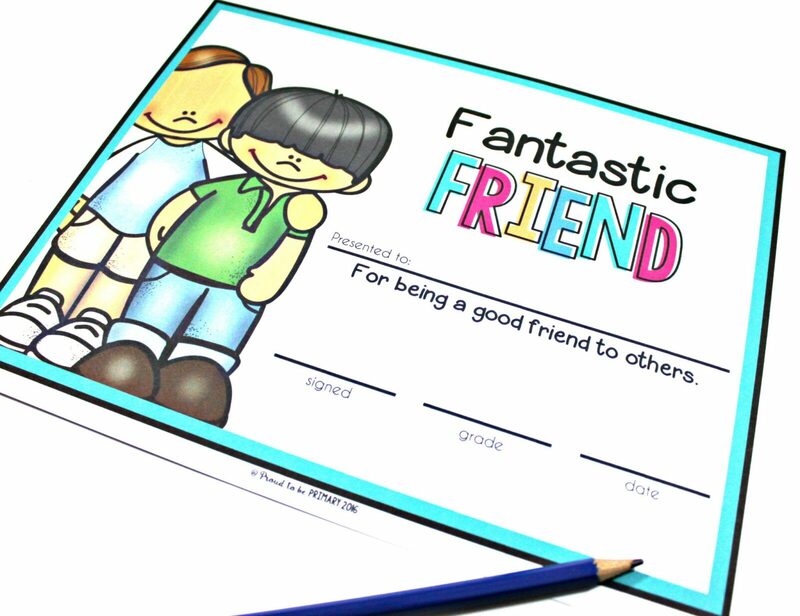 Give them an opportunity in class, just a few minutes a week, to write a thank-you note for someone. Encourage students by reminding them that the person they thank will be delighted at the unexpected kindness shown. Challenge students in class to meet a goal to try to do kind things for others regularly. A challenge can motivate and excite kids into completing a task and create a positive habit. In this case, the task would be to recognize when others do something nice for them unexpectedly, or to attempt to surprise others with random acts of kindness. Give them goals: You could give them a goal to meet, perhaps 5 acts per week, and a checklist or calendar to help them keep track. 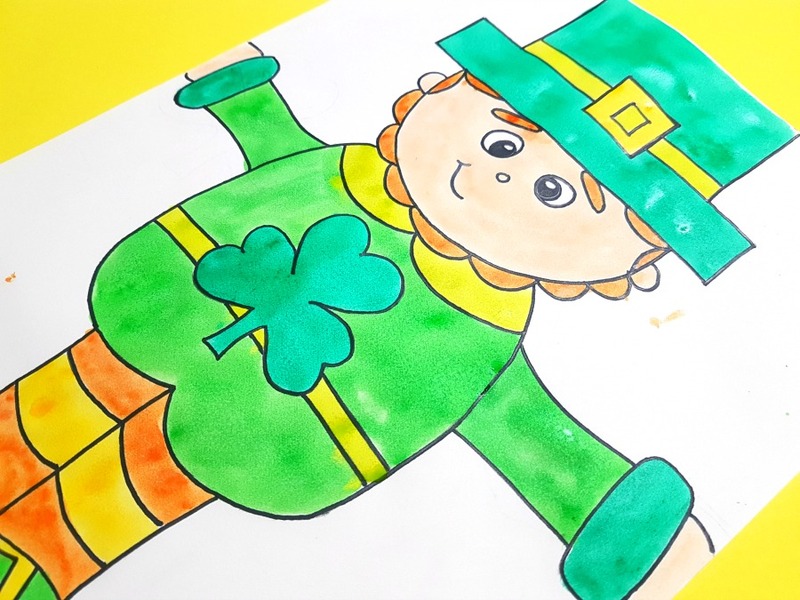 When they’ve completed the checklist or calendar, they could add a star to a classroom chart, or a shape cutout to a classroom bulletin board dedicated to the challenge. The things your kids do randomly for each other might be to sharpen a friend’s dull pencils, take a classmate’s trash for them at lunchtime, or send an anonymous note of encouragement to a peer who needs it. The Compliment Experiment: Make a point to give a compliment to each child during the day, without the other children noticing. At the end of the day, tell the students that you held an experiment all day, that you gave each child a compliment during the day, just to see if attitudes were improved throughout the day. Tell them you noticed a change in the atmosphere of the classroom for the better, and that showing kindness can do that. Encourage them to show kindness to others throughout the day themselves, and see what a difference THEY can make. 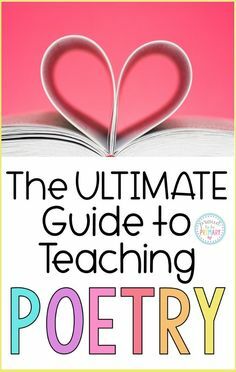 Literature units are a fun way to introduce and expand on topics in a meaningful way. Use a favorite book to teach your students about kindness, such as these. 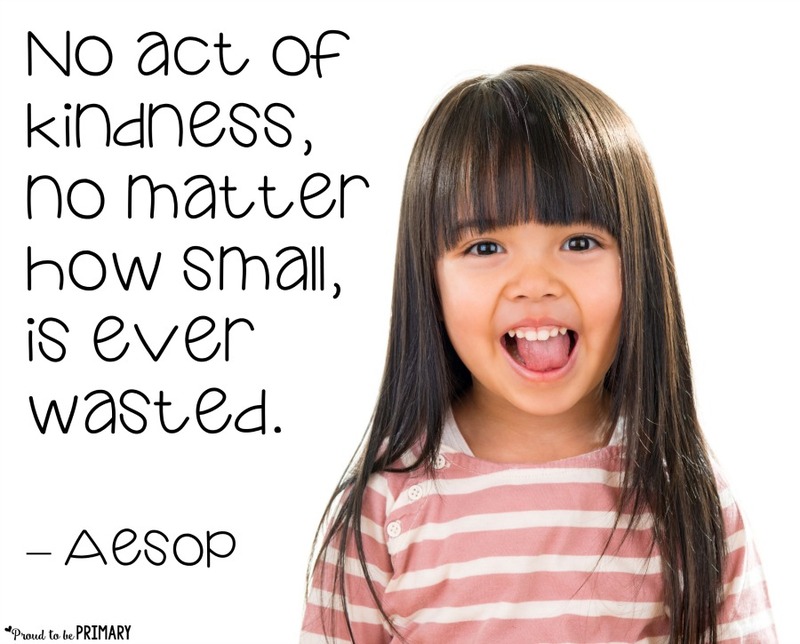 Add them to your list of kindness activities! The Kindness Quilt: One of my favorite books for K-2 that teaches kindness is The Kindness Quilt by Nancy Elizabeth Wallace. In this delightful book, the main character, Minna, is given an assignment to report on an act of kindness that she does. She can’t decide what to report on, so she ends up making a quilt with many kind acts represented, along with the help of her friends, classmates, and eventually the whole school. Lessons about kindness don’t have to take long. A short mini-lesson or discussion during your daily classroom meeting may be all you need. 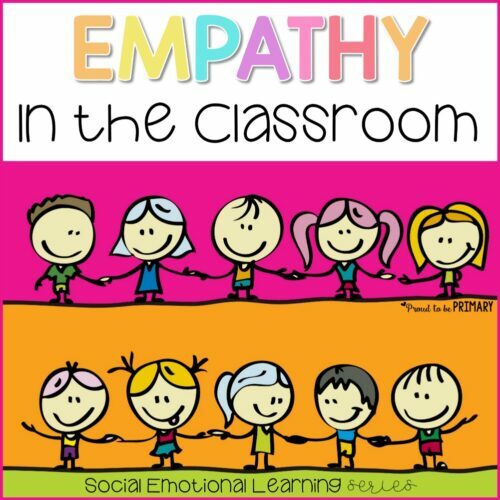 Or a classroom meeting may be the perfect time to address or introduce what kindness means. 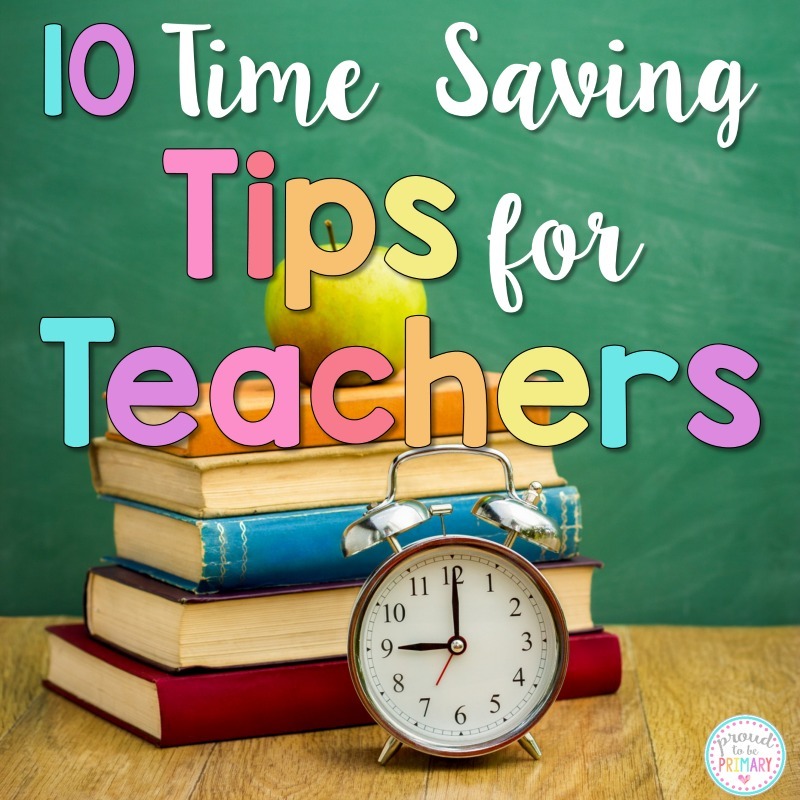 If you feel a longer lesson is needed, here are some ideas for you to check out. Inspirational Words: Write this quote from the Dalai Lama on a thinking map: “Be kind whenever possible. It is always possible.” Ask students what the quote means, and jot down their interpretations and extensions of the meaning. 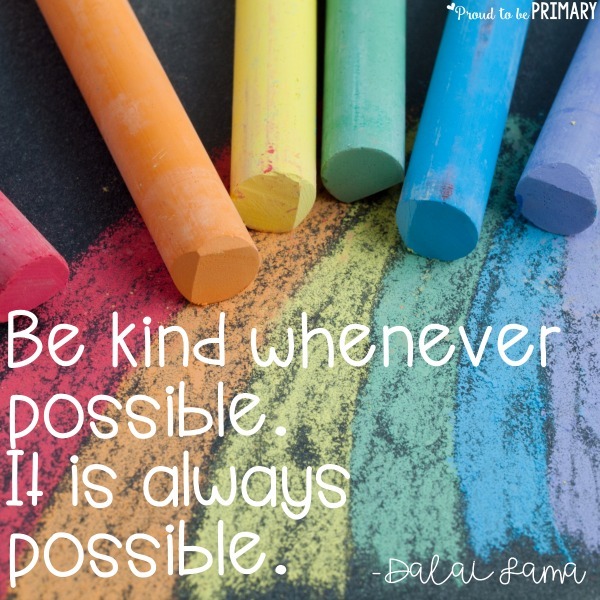 Give students a writing assignment to describe how we can be kind always. 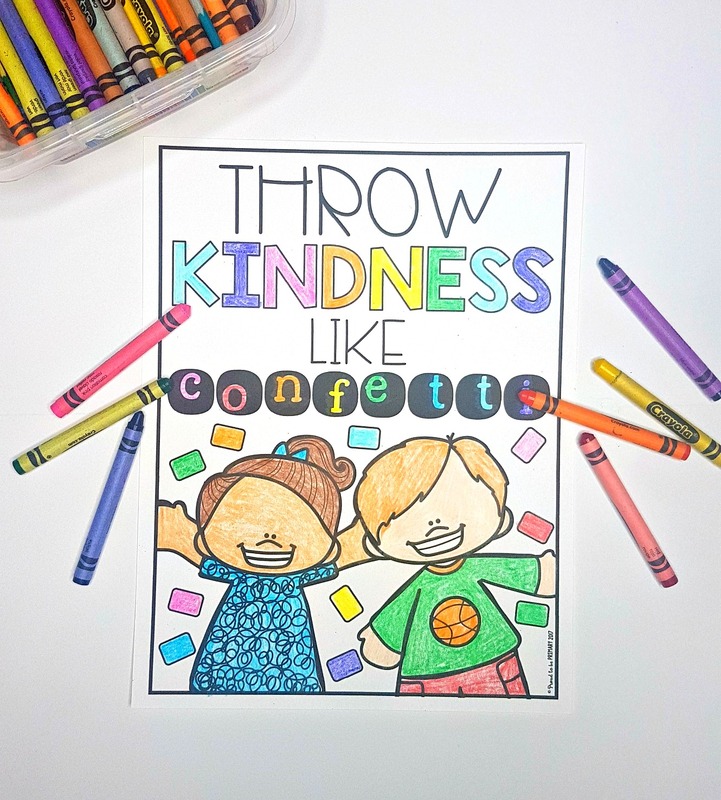 Teach them kindness quotes and have them color them in and display in the classroom. Literature-based lessons: Use The Kindness Quilt to teach a lesson on working together to promote kindness, and create a classroom kindness quilt of your own. Kindness Role Playing: Children need practice being kind, especially if these examples are not evident in their lives. 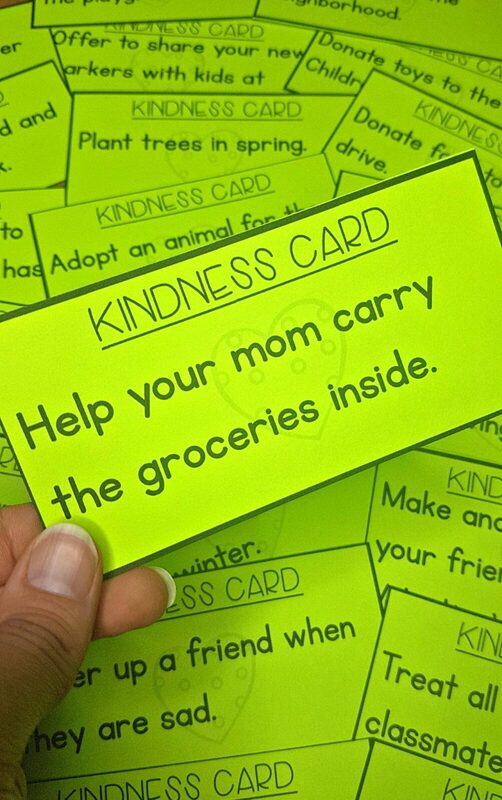 Give them simple scenarios they can act out or play a kindness game using Kindness Cards. Make it an occasion worth celebrating: Make a point yearly to celebrate “National Kindness Day” (February 17th). Here is a lesson plan to give you some ideas. For more information and resources, check out the educator resources page at randomactsofkindness.org. 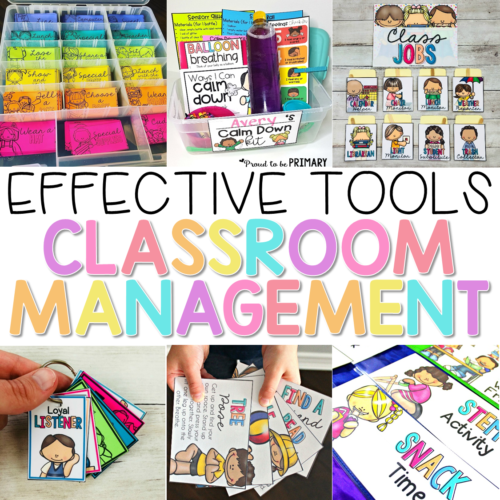 There are tons of resources there for each child in your room. A well-timed word of praise or a cheerful award can be all it takes to reinforce good behavior. Here are several ideas for ways you can positively reward acts of kindness in your classroom. Try some of these ideas for when you catch your students in the action of showing kindness to their classmates. Praise and kindness go a long way, as do simple things like coupons, a marble jar, certificates, and brag tags. Read more about these creative and cost-effective rewards. Give your students something they can give too! 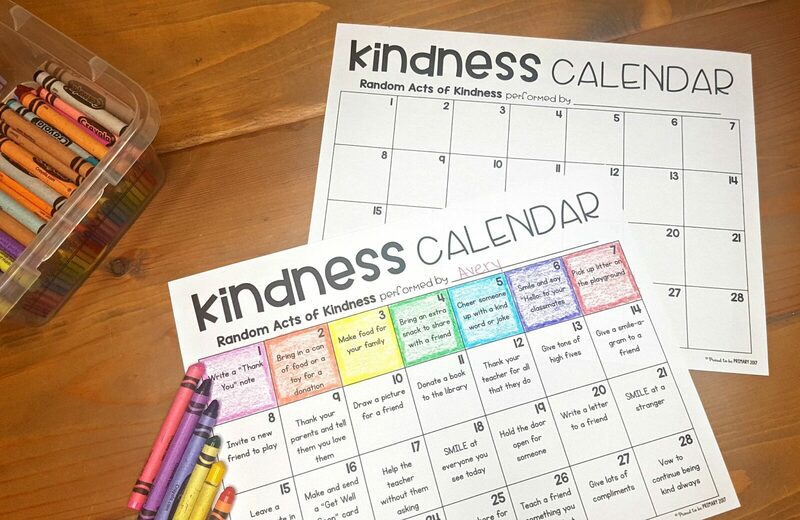 These kindness cards are the perfect way for students to announce their pride in themselves for doing good, and to spread the word and motivate others to do the same. 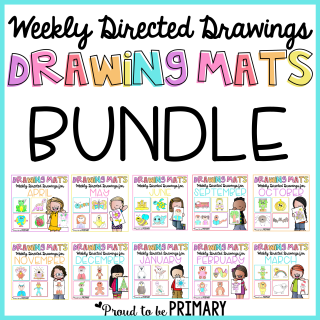 Here’s a freebie for you to use in your classroom. Give students these kindness awards to praise them for their acts of kindness in the classroom, and encourage a pattern of behavior to be continued. 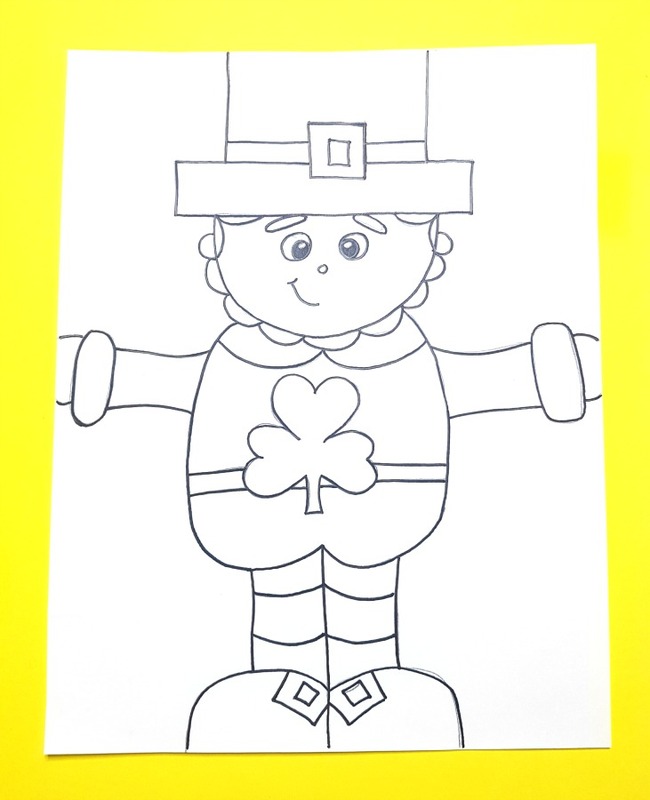 Click the image to download this resource and add it to your kindness activities. 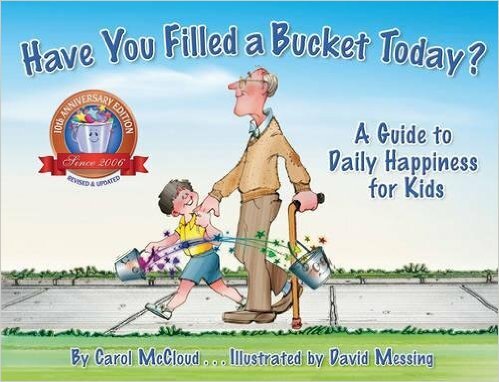 Looking for detailed lesson plans filled with activities and discussion ideas on kindness, generosity, and bucket filling? The Kindness curriculum is for you! Looking for more kindness activities and lessons, plus lots more social-emotional skills? 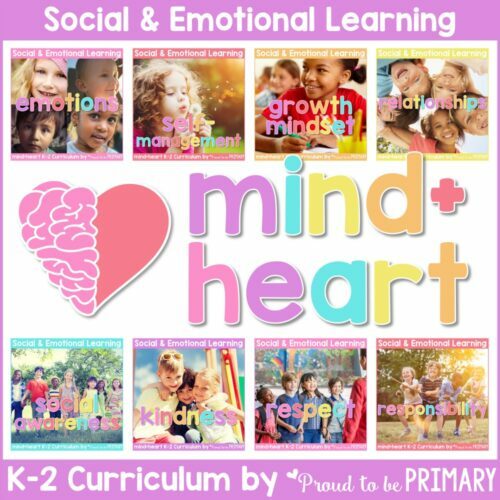 Check out the mind+heart SEL curriculum! 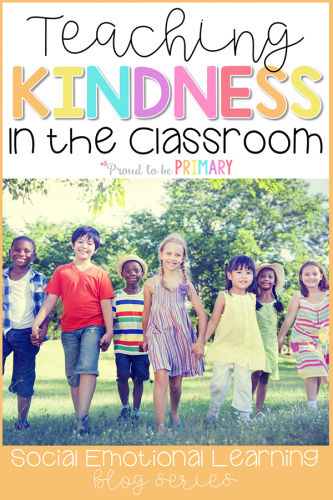 Promoting kindness in the classroom is a win-win situation for you and your students, especially with these kindness activities. Everyone will enjoy giving and receiving acts of kindness, and as a teacher, you’ll smile at the uplifting attitudes of your students as they do. 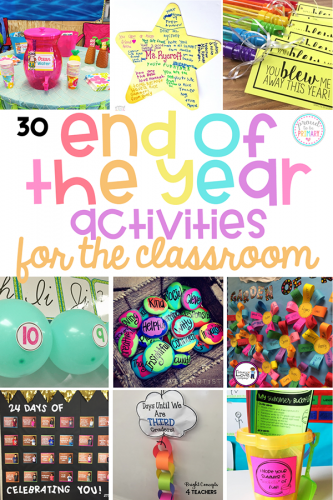 Tons of end of the school year activities for the classroom. Plan the end with these themed days, countdown, gift ideas, games, bucket lists and more! 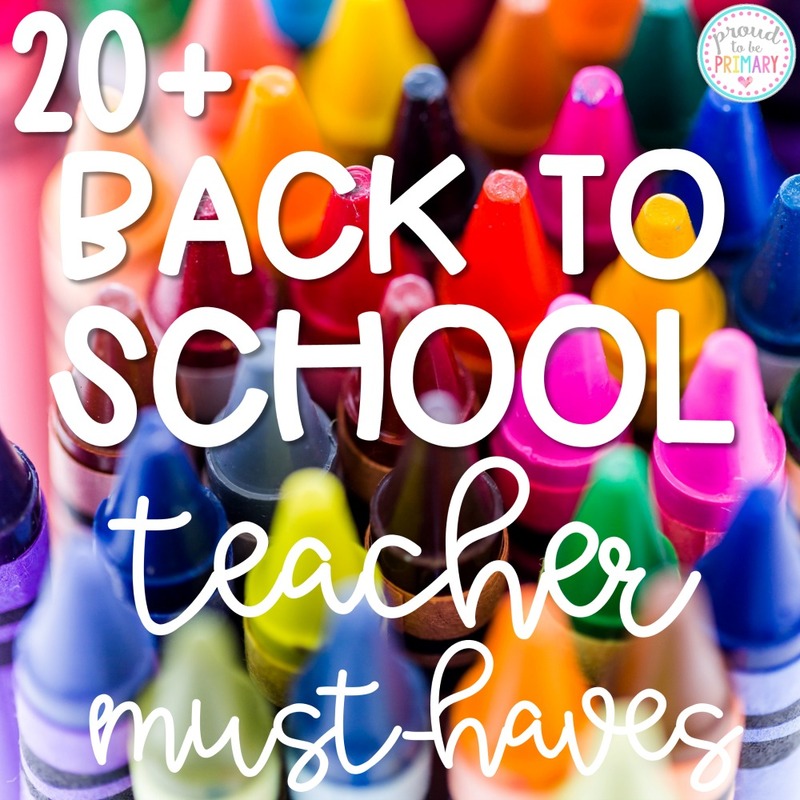 As the end of the school year approaches, it’s time to plan some fun activities, lessons, and gift ideas for your students. 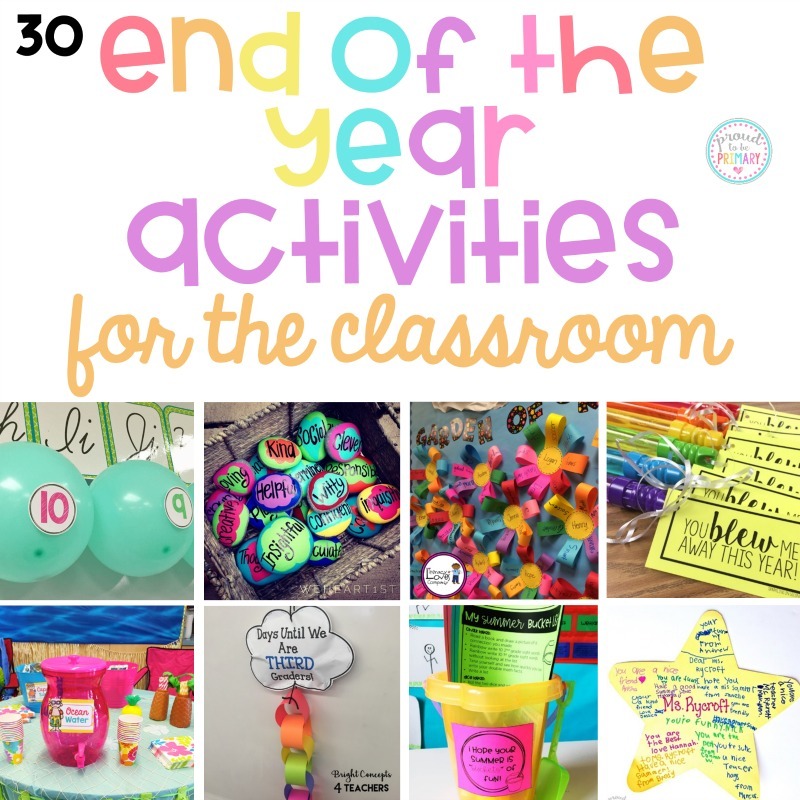 I’ve searched high and low and came up with 30 end of the school year activities for the classroom. 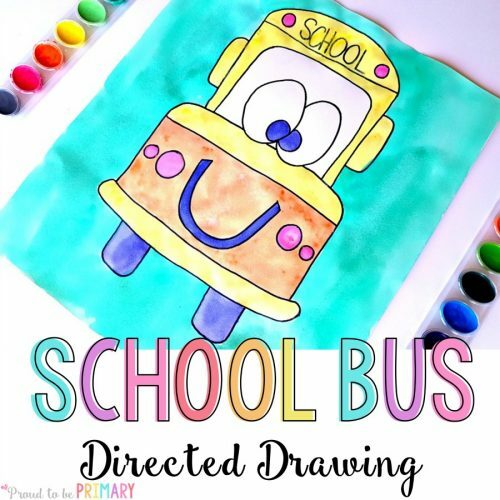 I think you’ll enjoy these creative ways to celebrate and close out the end of the school year too! You and your students have worked hard all year, and you all deserve to have a little fun during the last days! 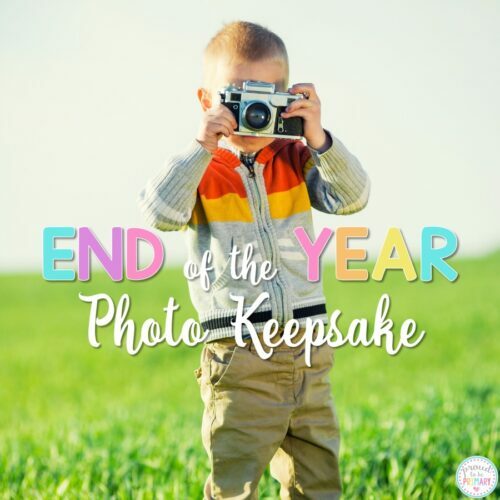 I have scoured the internet (hello Pinterest) and gathered awesome ideas from my teacher/blogger friends to bring you the best ways to celebrate the end of the school year. 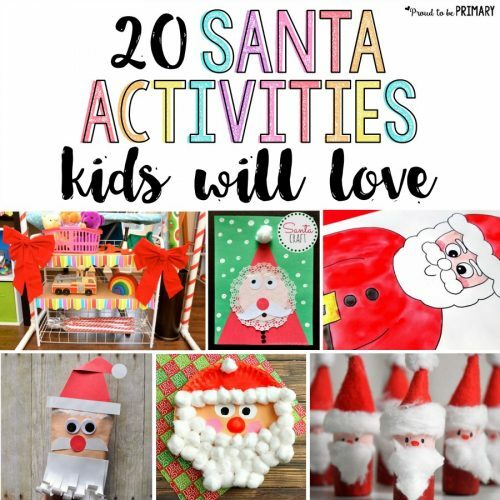 There are themed days, countdown ideas, arts and crafts, games to play, gift ideas, outdoor lessons, bucket lists, lesson plans, party ideas, and organization tips for you. 1. The weather is hot, and the kids just want to go on vacation. So, why not create a vacation within the classroom? Here’s an idea for a beach themed day. 2. Themed days are so much fun for the kids and really throws some excitement into your normal, daily routine. 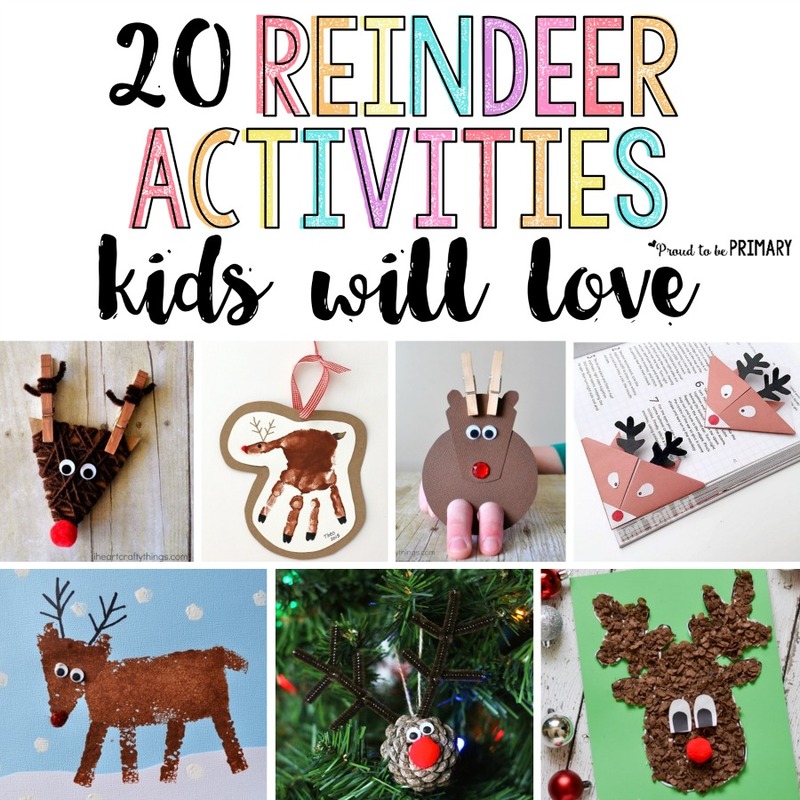 Here are 12 theme ideas such as camping, STEM, water, game, holiday, sports, decades, art, travel, and more. 3. A countdown chain is just a simple paper chain that you can use as a visual reminder of the days remaining. 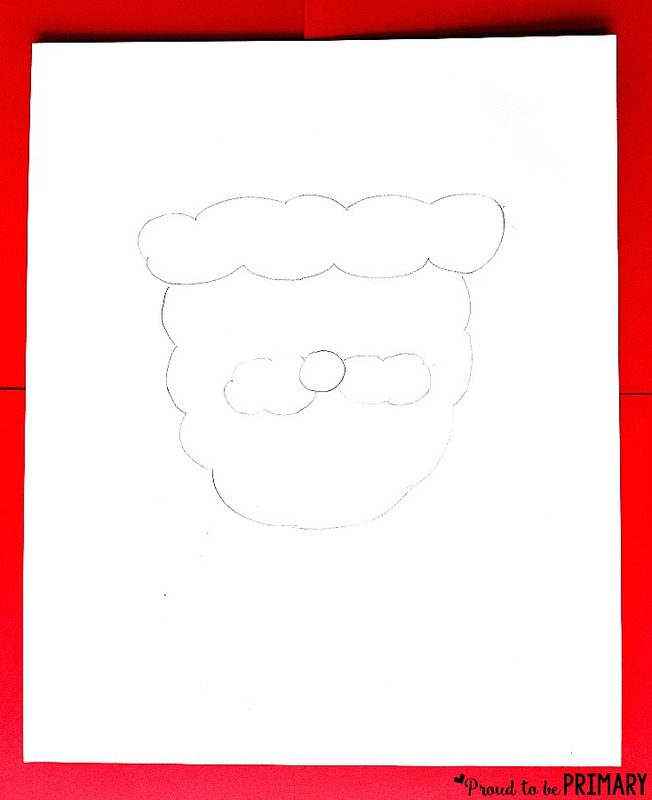 But with a cheery cloud and bright colored paper, it will be a fun daily task. 4. 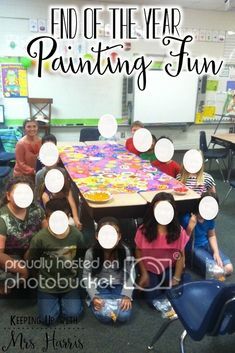 During the final days of school, celebrate with “Days of You.” Each child gets a day devoted to them and receives kind words written on an anchor chart as well as special privileges on his/her day. 5. Another way to countdown the last few days is by popping a balloon each day. Inside is a special privilege or activity to do together. 6. 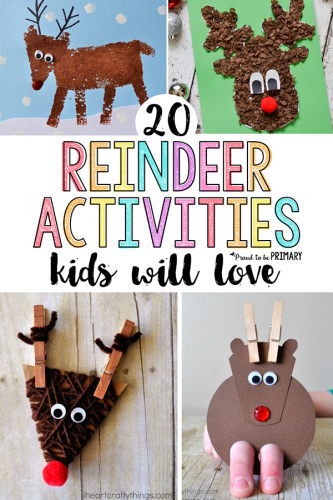 The end of the school year is conducive to activities that keep excited little hands busy. 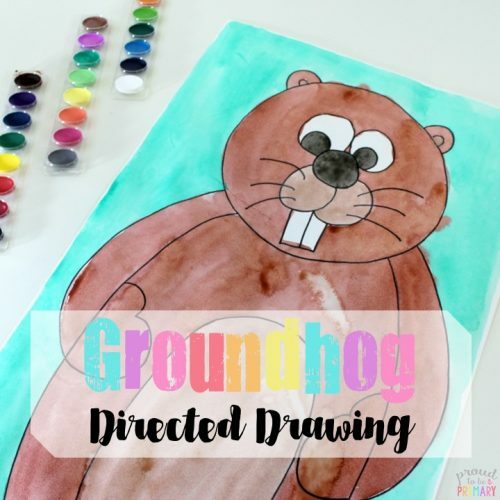 What better way than art activities such as these! 7. Minute to Win It is a popular game based on the TV show. 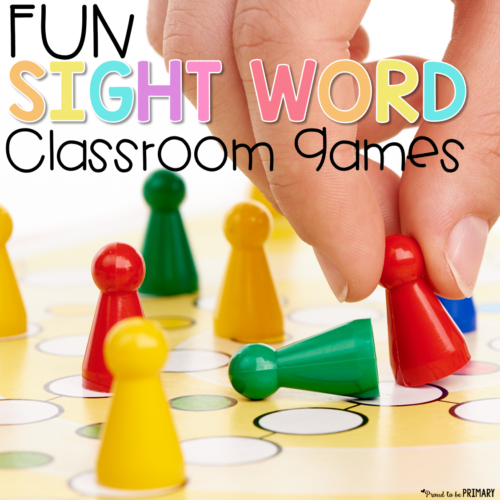 Here are some fun tasks to try out in your classroom to replicate the game. 8. Kids love candy, and this candy ball game is a blast. The laughter and screams of delight will make the other classrooms down the hall jealous during this fast-paced challenge to get the candy out of the ball. 9. Get kids chatting about their summer plans and even learning things about each other that they may not have known, in this fun end-of-the-year BINGO game. 10. If you teach kindergarten, an alphabet party is the “P”erfect “P”lan! Just label items with the letter they begin with, and you’ve got “P is for Party”! 11. Students’ hard work deserves to be praised. 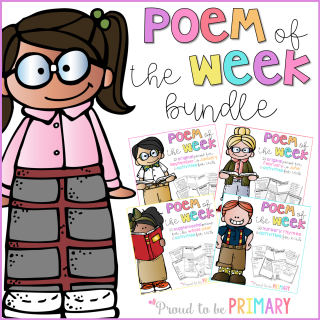 They will love these certificate awards and brag tags that show how proud you are of them. 12. 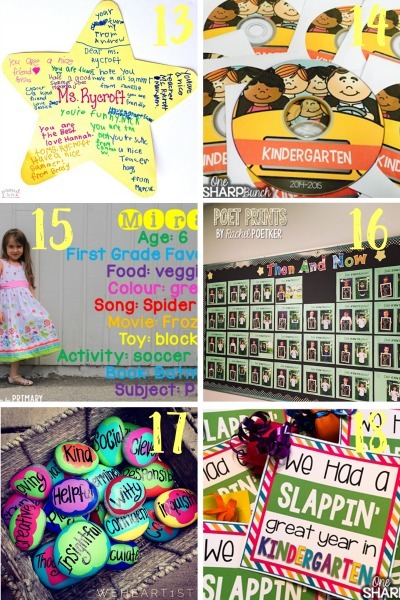 Brighten up your bulletin board with a display that celebrates each child in the classroom. The Garden of Greatness wall will remind students of their uniqueness and individual accomplishments. 13. 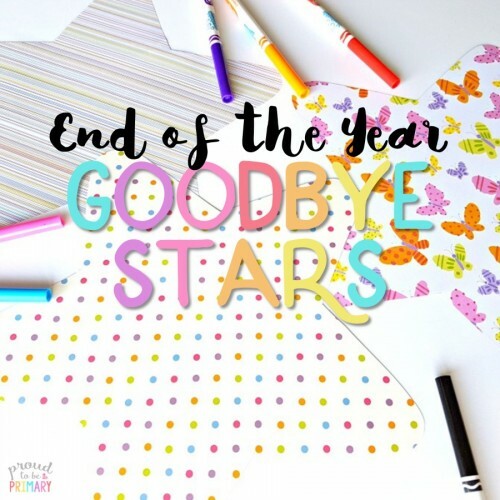 Create goodbye stars with your students, and include them in their goodbye bags on the last day of school. 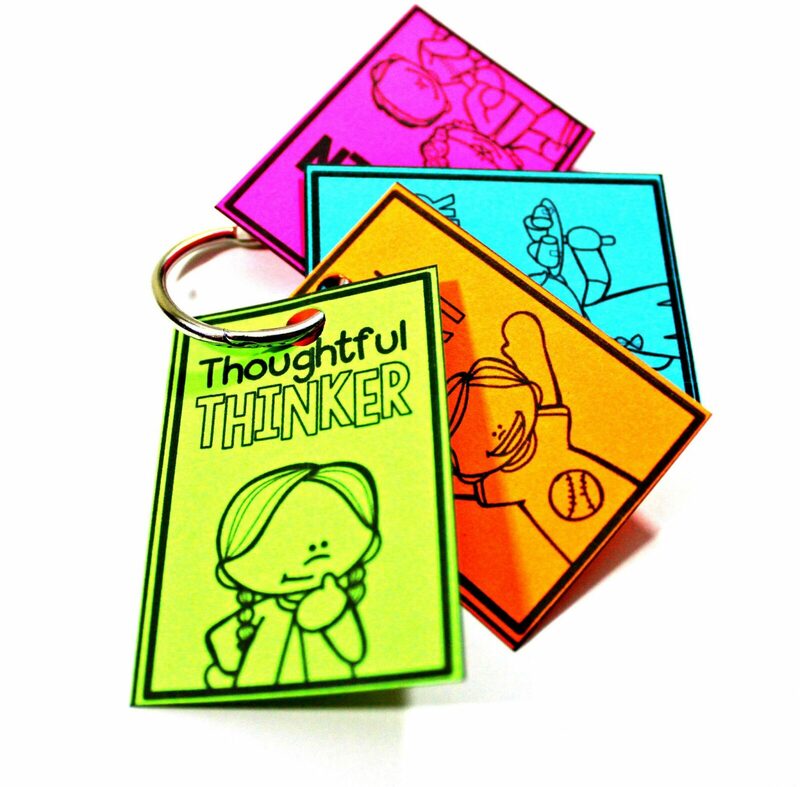 They provide each child with positive encouragement and kind thoughts to take home with them over the summer. 14. 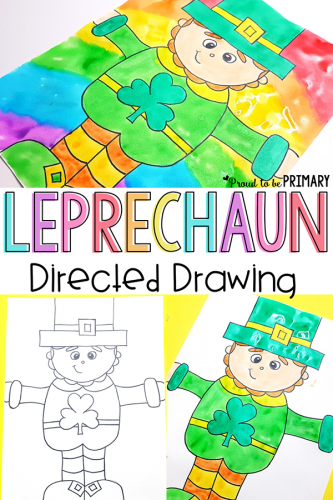 Use Windows Live Movie Maker to create a gift DVD for your kiddos. They will enjoy watching a slideshow of photos from the year set to music. You could even show the movie during an in-class celebration of learning at the end of the school year. 15. Looking for special keepsake idea? Try this fun photo idea. 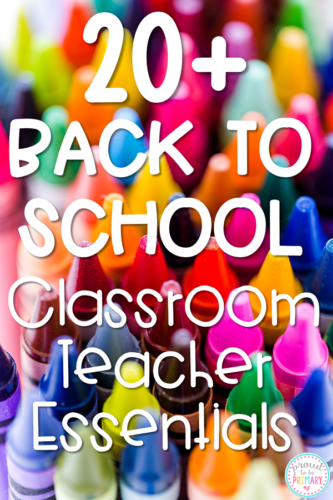 It includes a FREE printable survey to get teachers organized and kids writing! 16. 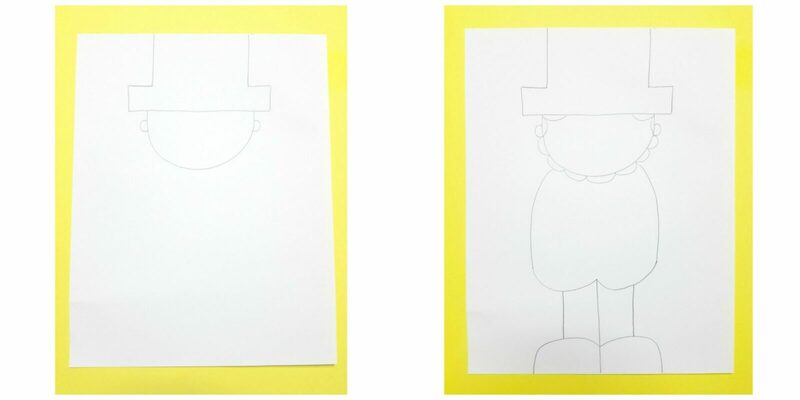 Create a “Then and Now” bulletin board. 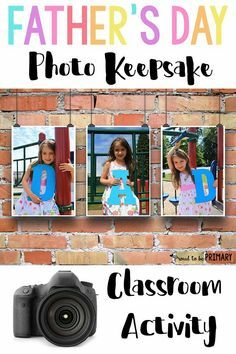 Not only is it a great way to decorate the walls of your classroom at the end of the school year, the photos also serve as a nice gift for your kids (or their parents) on the last day of school. 17. A sweet little gift is a character rock, on which you write a word that describes a child’s character. Paint the rock with bright colors, and bold lettering and the child has a keepsake that also bolsters their self-esteem. 18. 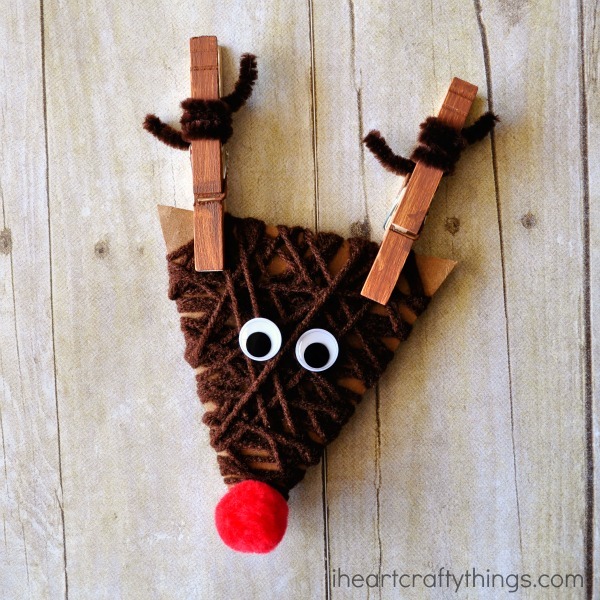 Don’t have much time to make a DIY gift? These slap bracelets are fast and easy to put together and a slappin’ good fun! 19. A simple and resourceful gift is to encourage kids to have a bright summer with these sunglasses. 20. Tell your kids how proud of them you are with the sentiment “You blew me away” and some bubbles. 21. Give your kids summer packets in buckets! 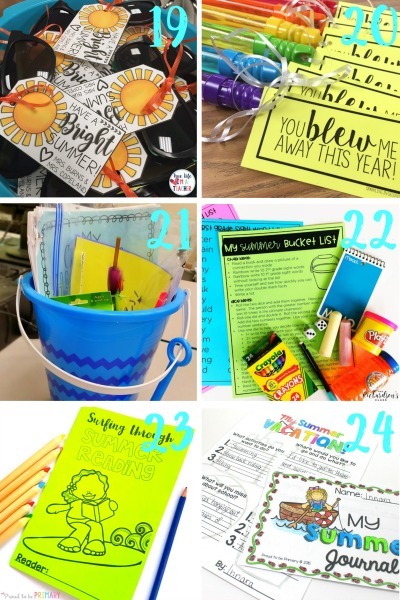 Buckets are a creative way to take home some things you hope they’ll continue to practice over the summer to avoid the summer slump. 22. 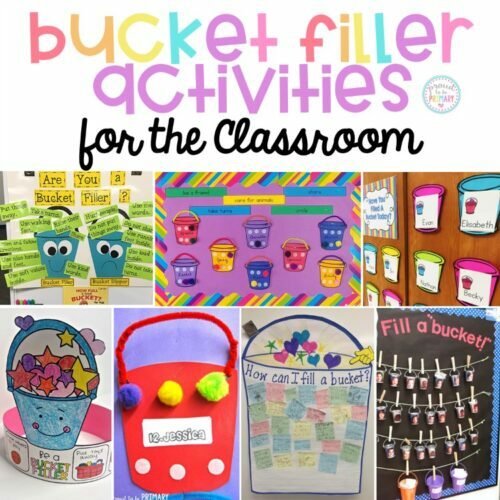 Make those buckets extra special for kids with some of these ideas! 23. 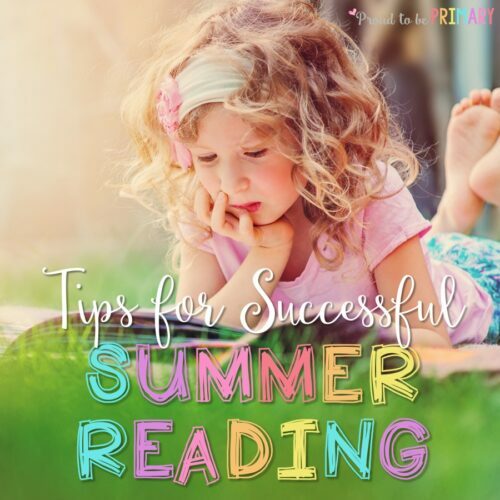 Avoid the summer reading slide with this summer reading resource booklet. 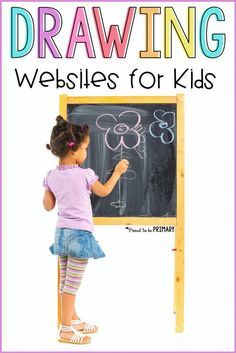 It includes a bucket list of creative places to read that kids can check off as they do them. 24. 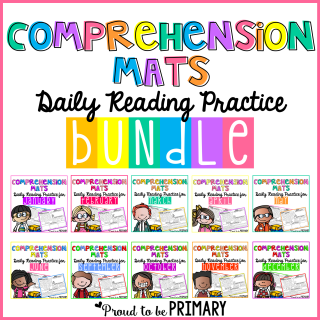 Keep them writing and practicing word work over the summer with these printables stuffed into their buckets! 25. The simplest ways for making the last few days memorable can be done outside. 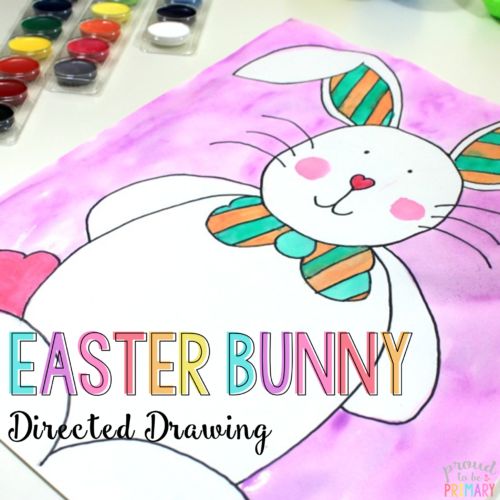 Try blowing bubbles, creating with chalk, and more! 26. Science and Language Arts can be all about summer, too! Try out this summer unit where kids can learn all about the honeybee, sunflower, and starfish. 27. 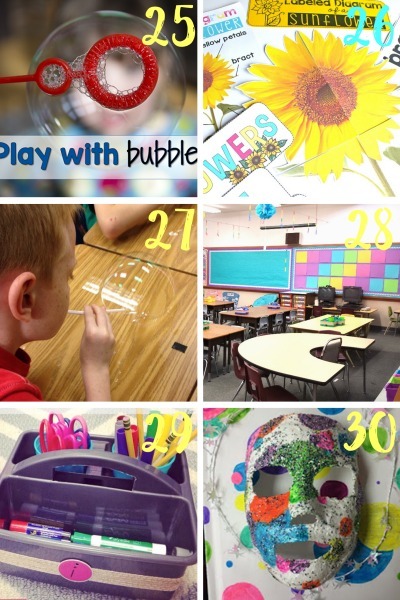 Let kids clean their desks with bubbles! Not only does it get the desks clean, it is also fun! 28. Get ready for back-to-school, NOW! Here are some tips to start thinking about ahead of time. 29. 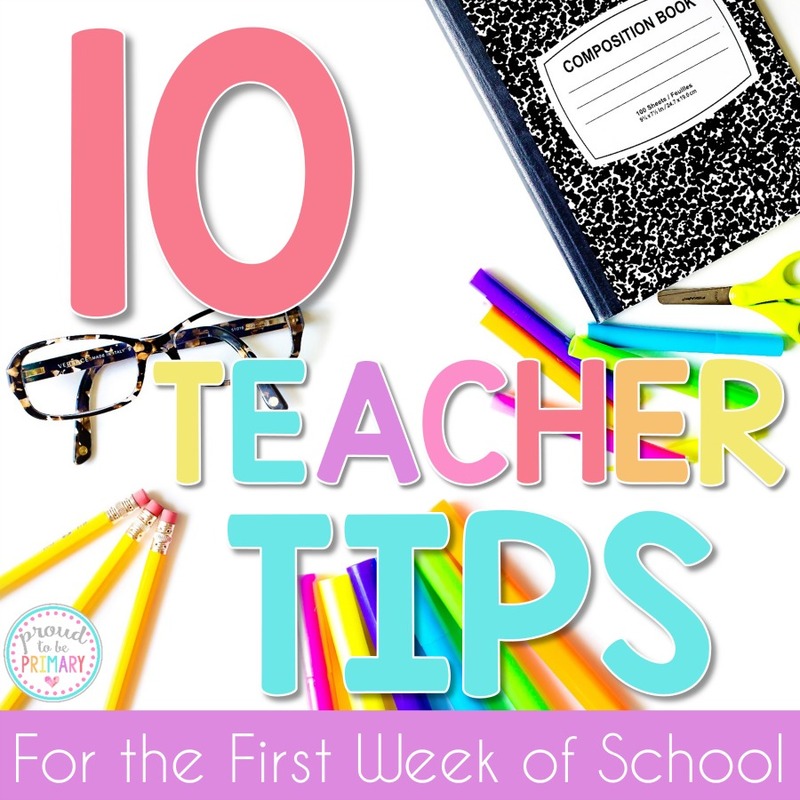 Go ahead and organize, print, and prepare supplies and resources for the beginning of next year. You can even let the kids help you! 30. If you want to create an end-of-the-year portfolio for your kids, why not make it spectacular? 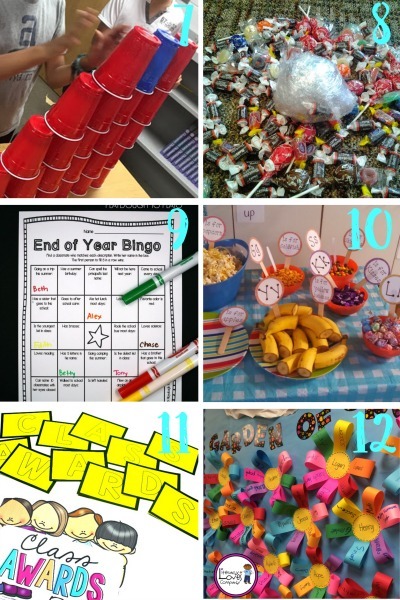 These 30 fun ideas for planning the end of the school year in your classroom will keep you and your students busy during those last weeks of school. As the countdown to summer begins, try some of these activities, and let me know what you thought of them! 6 ideas for teaching a gratitude lesson in the classroom. Encourage kids to reflect and be thankful by writing in a gratitude journal and more activities! We all know that the attitudes of the kids we teach have a huge impact on the culture of our classrooms. We want to inspire positive attitudes and increase empathy and community. 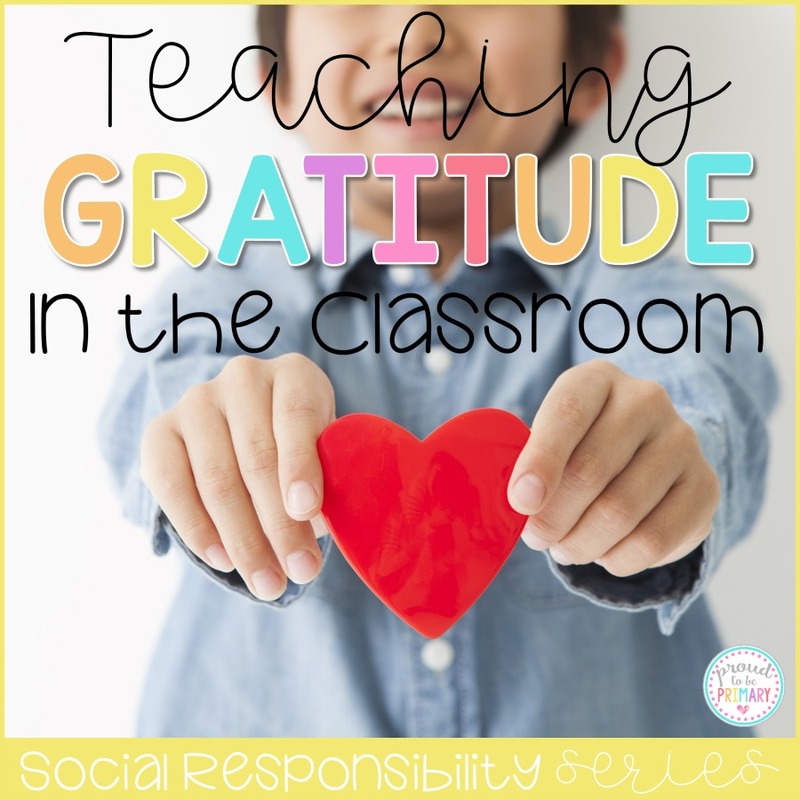 Teaching gratitude in the classroom is one way to do that. In my series on building social responsibility, I am attempting to address these character traits. The following ideas are six ways in which we can be teaching gratitude in the classroom. 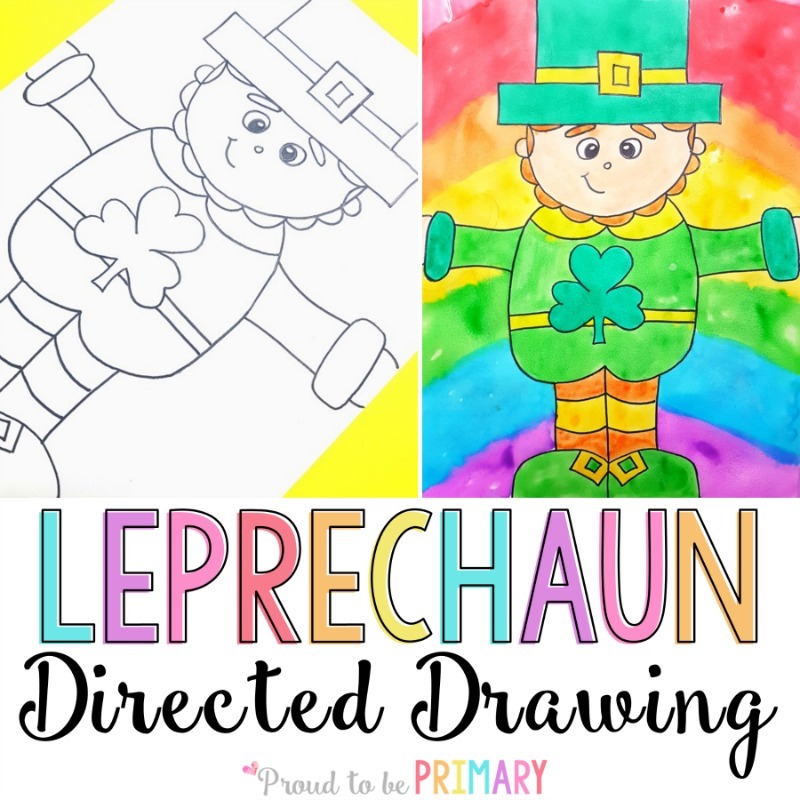 Continue reading to the end of this post to find free printable resources you can use with your class. 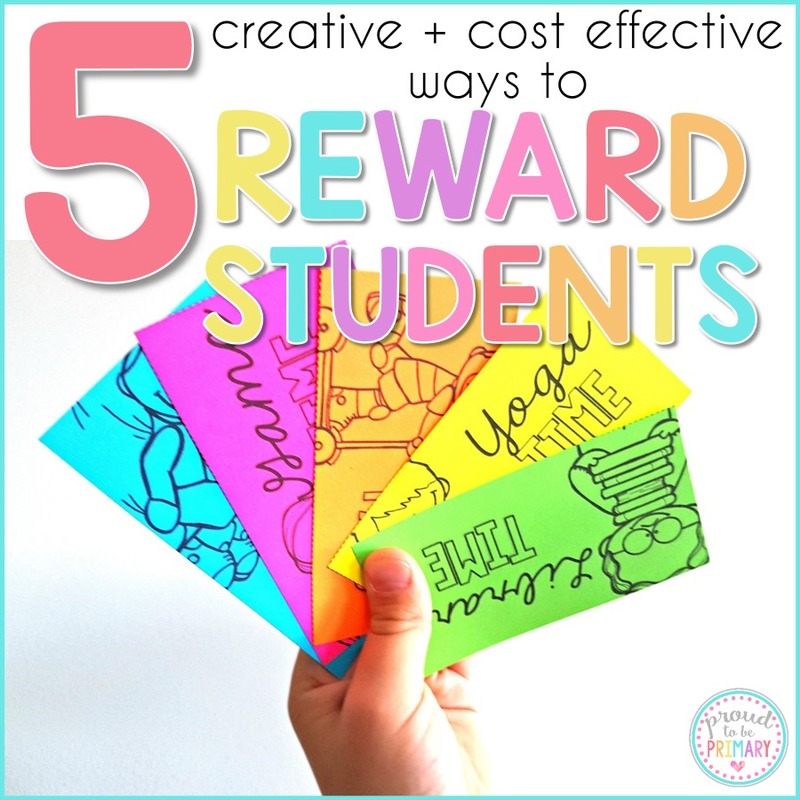 Rewards for Kids: 5 Creative and Cost Effective Motivators! 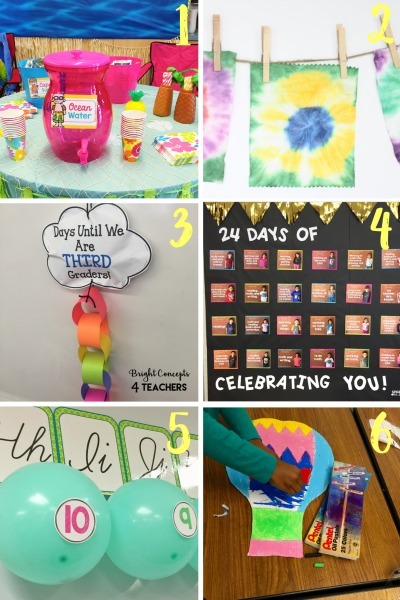 Teachers will love the 5 creative, cheap, and fun REWARDS for kids, that include coupons, Brag Tags, and more ideas that are positive and motivating. There is no doubt that children respond to rewards. The key is finding the right kind of rewards for kids that don’t break the bank, yet keep motivation up. Teachers spend enough of their hard earned money already. Filling those treasure boxes with dollar store items can add up. It’s time for teachers to save their money and use alternative methods. We all want our children and students to develop intrinsic motivation. Moving away from store-bought items is a step in the right direction. Kids don’t need more “things” to add to their pile at home. Store bought items are exciting to get, but they quickly lose their “uniqueness” after they are received. The key to success here is thinking of rewards for kids that are creative, fun, and make a lasting impact. Giving rewards that create moments and have meaning is what matters and what sticks in a child’s mind. Below are 5 Creative and Cost Effective Rewards for Kids. Praise a child when they do the right thing. Tell them descriptively what they did well. Give compliments when their actions and choices are the right ones. They are more likely to do those things again if they see and hear from an adult they trust that they did the right thing. Smile and be kind to students even on bad days. They look up to you and they want and need to see that you like them. Children are more willing to try and do the right thing if they feel supported and valued. Kindness and praise go a long way. HOW: This type of rewards does not require any prep, but it does require acknowledgment and possibly a change in your thought process. Smile and say “Good morning!” to all of your students at the door. Make a plan to say something nice to each student at least once a day. For those students needing a bit more help and encouragement, make it a point to intact positively with them twice a day or more! Work hard to fill those invisible buckets! COST: $0 and the positive results are endless! Coupons are the perfect versatile reward system. Reward any behavior or accomplishment of your choice any time of day. When a child does something positive, they earn a coupon from a coupon box or drawers. 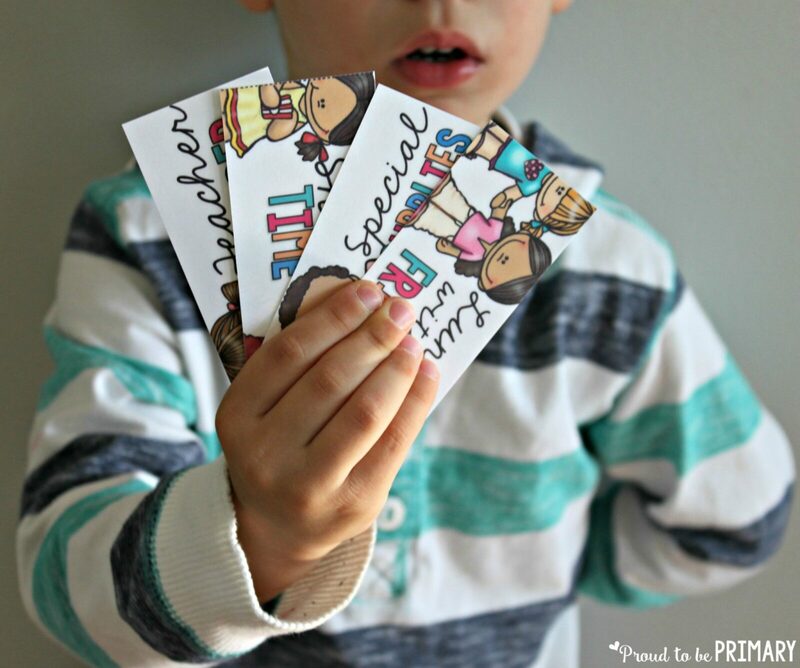 Give children a choice of what coupon they would like to have. The coupons says things that children enjoy doing. They say things like “Wear Shades” or “Lunch with a Friend” or “Special Supplies”. Students love choosing what is important to them. Each coupon is motivating and fun. 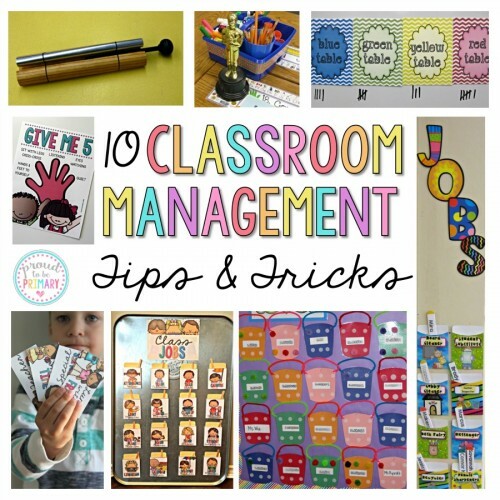 HOW: Make an anchor chart of your classroom expectations and rules. Reward students who follow the guidelines with coupons daily. Whatever your class is working on or improving, use coupons as a motivator. 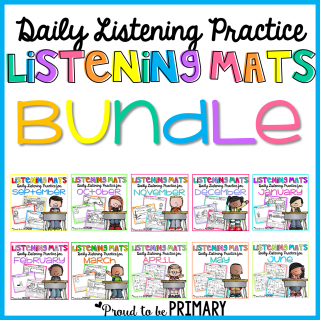 Give the quietest students at the carpet or the student who solves a problem independently a coupon. Surprise students with coupons out of the blue when they deserve it, work hard, or try their best at something. COST: There is only the initial cost of buying the coupons, printing and laminating them, and buying a coupon box or drawer organizer. You can try a free coupon pack to see how your students like it. Coupons don’t cost a thing once your materials are organized. They require some planning and time, but the enjoyment of getting and using them is limitless. Getting to pick their own coupons and experience fun at school is the reward. This class management method is incredibly simple to initiate and effective for whole-class goal setting. Every time a marble is dropped into the jar, the class is one step closer to a predetermined reward. The goal is to fill up with marble jar. Students work together with their classmates to listen, work hard, and follow classroom expectations. They are rewarded at first with the marble in the jar and later with the class chosen reward. It’s the “hard work pays off” mentality. Success is achieved when everyone works together towards a common goal. HOW: Have a class discussion about teamwork and working cooperatively towards a group goal. 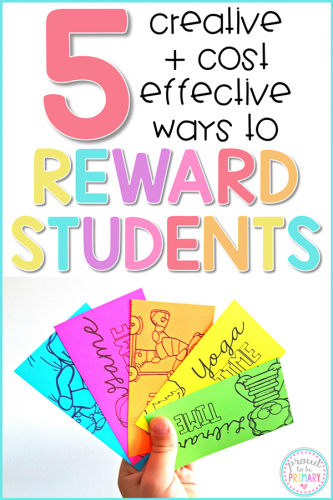 Create an anchor chart together and have students suggest ideas of whole class rewards. Encourage students with ideas such as getting extra recess, having a dance party, or going outside for a picnic lunch. Have a vote as a class and let the top choice be the whole-class reward once the jar is full. Create a list for yourself of the time of the day that you will use the marble jar. Put the jar somewhere visible to everyone and easily accessible. Marbles make a sound every time they drop into the container. The sound will draw students’ attention to what is happening and remind them of what they are working towards. 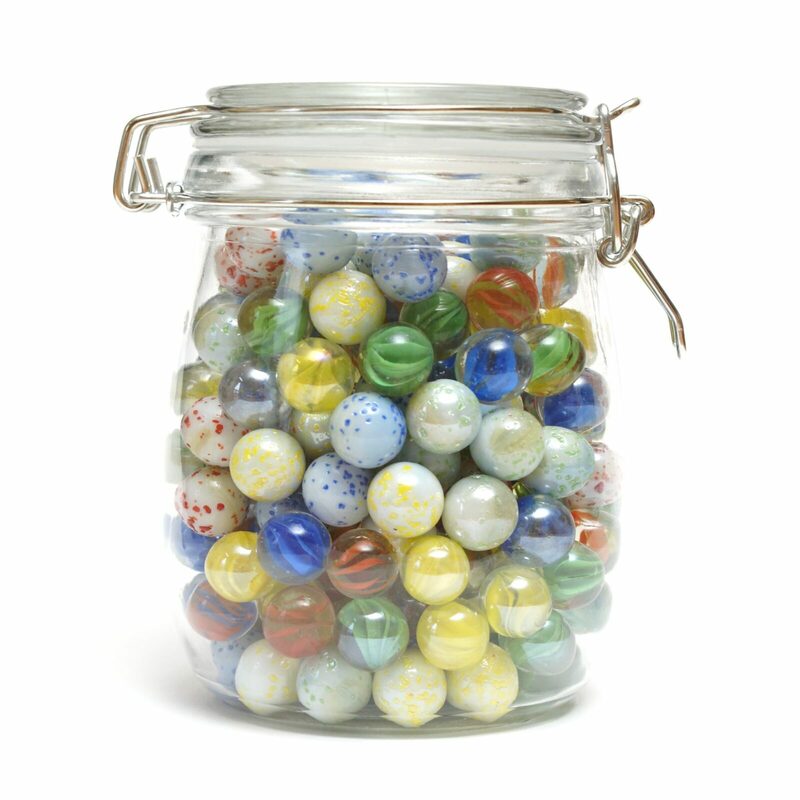 Remark to students how full the jar is getting as you add marbles to motivate them further. Once the jar is full, celebrate with your class. COST: A few $ dollars at the dollar store to buy a few bags of marbles and a clear jar or container. Students need recognition to know that what they are doing is right. Especially at school. Certificates are one way to give validation. Go a step further from praise and kindness. Let students know they have done a great job and to keep it up. Certificates are tangible and something to hold. They serve as a keepsake. Children often take them home to share with their families and post on their bedroom walls. They are a source of pride. HOW: Decide what actions and behaviors warrant certificates. Ask yourself when they will be given, how, and to whom. Certificate rewards are great for celebrating milestones, such as reading achievements, having a birthday, or losing a tooth. They are equally special at the end of the year during a class awards ceremony led by the teacher. Prep the certificates ahead of time and organize them together in an accordion folder. COST: Getting the certificates, paper, and ink are the only costs. The positive feelings are completely FREE! Brag Tags are mini versions similar to certificates. Brag Tags are given out at various times of the year to celebrate school events and to recognize achievements along the way. They are small and kept together on a chain necklace or binder ring. Classes may hang their tags together as a symbol of pride. Children love to collect them and to see their collections at the end of the year. HOW: There is a bit more involved in preparing Brag Tags. 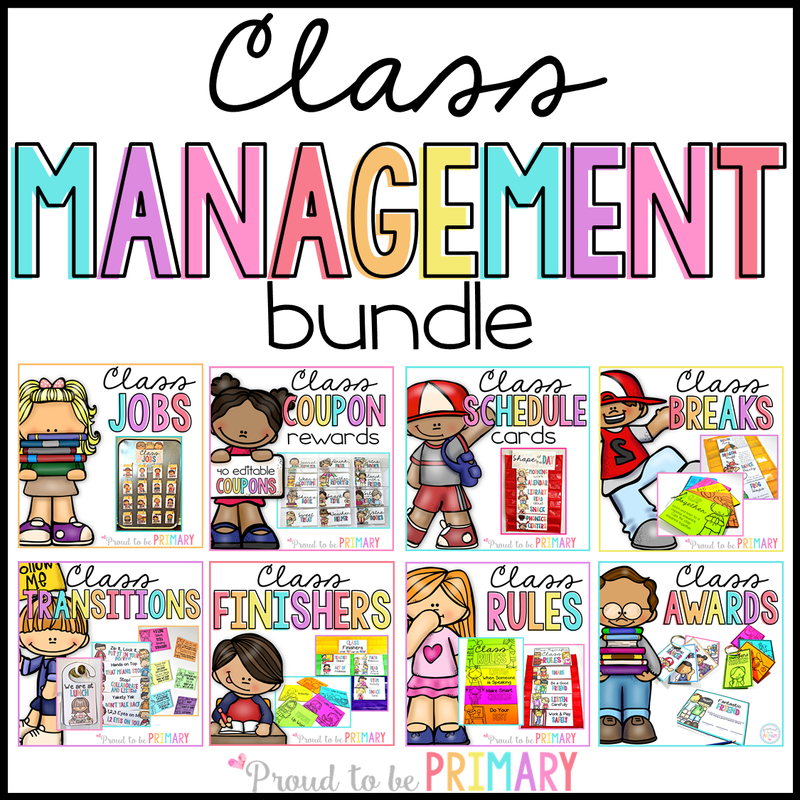 You will want to print and laminate a class set of each type you plan on giving out ahead of time. There are many drawer organizers available that can hold Brag Tags in an organized fashion. Plan a way to give the tags out and how you will add them to their necklaces or rings. 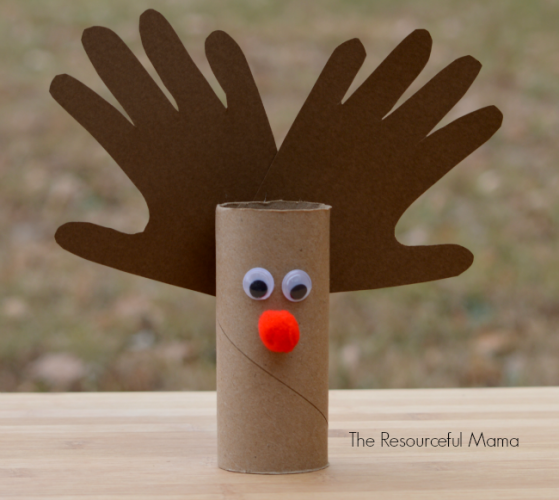 COST: You will need white cardstock or colored paper, a printer, laminator, a heavy-duty paper trimmer, a box with drawers or display shelf to house the tags, and chains or binder rings to hold the tags. Once you have your supplies ready to go, the excitement can begin! 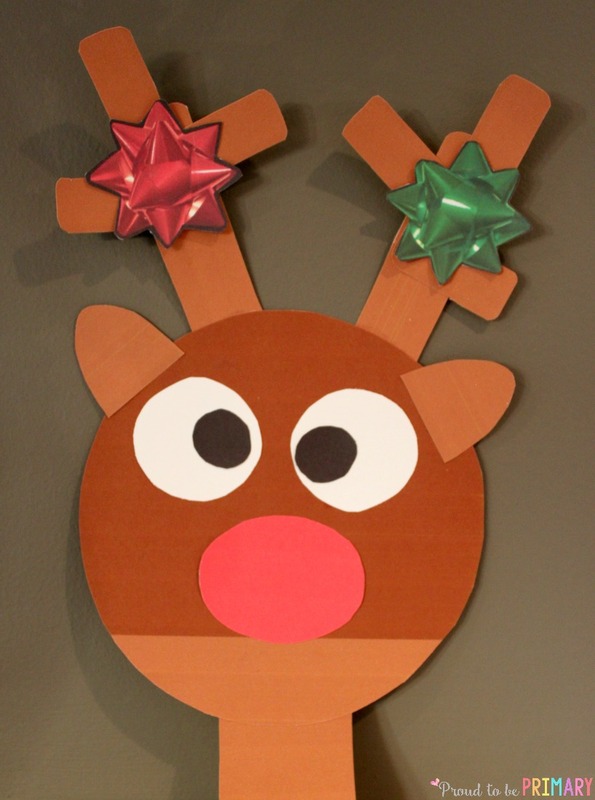 Consequently, kids will feel so special as their collections grow! Upon deciding which type of reward to use, click one or both of the images below to grab your free reward coupons, Brag Tags, and certificates! Do you use rewards? What are your favorite rewards for kids? I hope the ideas above will save you money, let your class have fun, and leave everyone with good feelings inside! 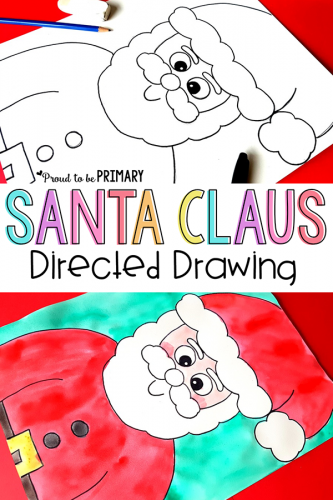 Christmas classroom activities for teachers. Arts & crafts, games, activities, decorations and cards, gift and book ideas, STEM activities and more! 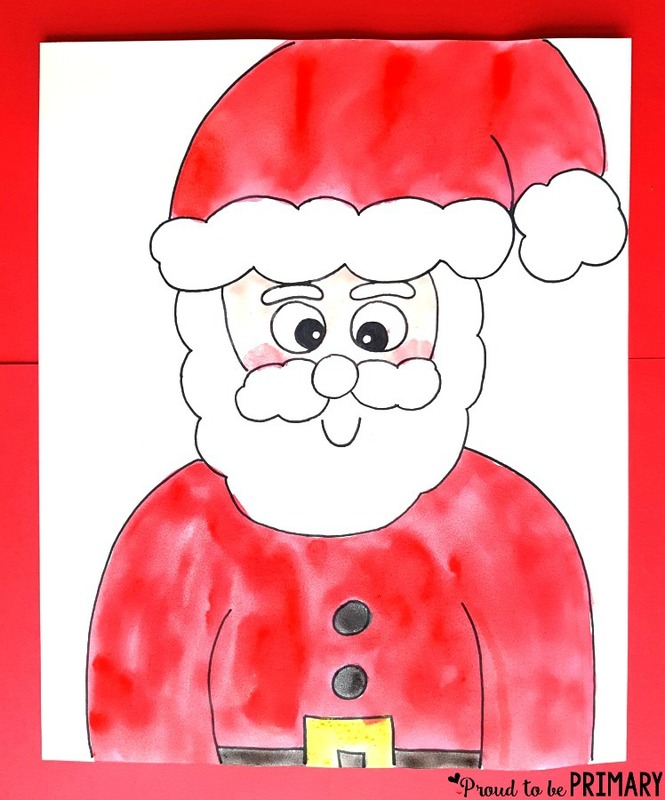 Celebrating the holidays and Christmas is a special experience for children. Bringing these celebrations into the classroom makes learning memorable. 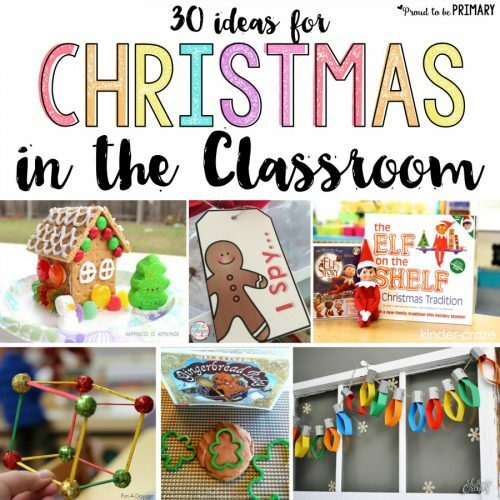 Teachers can accomplish this with the following 30 Christmas in the classroom ideas. Teachers go out of their way everyday for their students. They love to share and celebrate with their little families at school before the break. 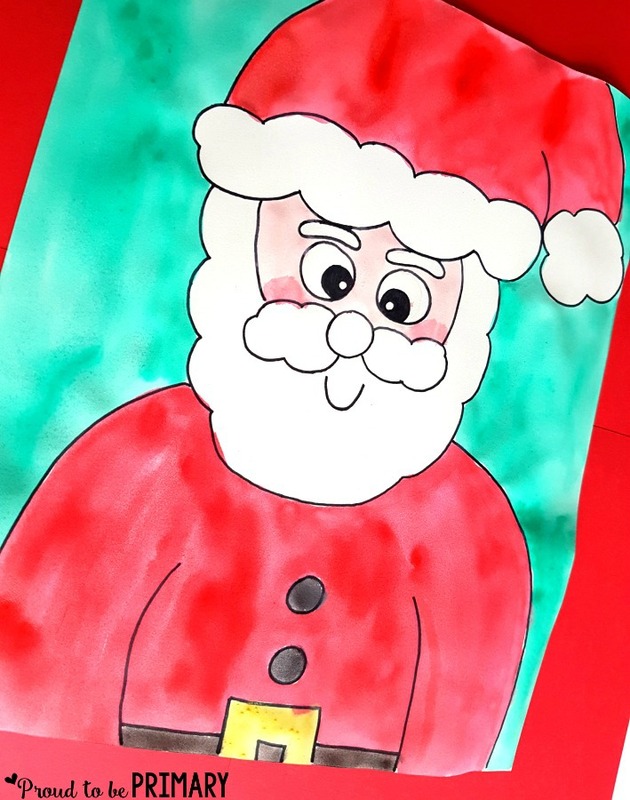 Teachers enjoy decorating their classrooms and planning Christmas activities for children that they may not have at home. Taking this time away from the rigor of day to day school life to celebrate together is a magical thing. 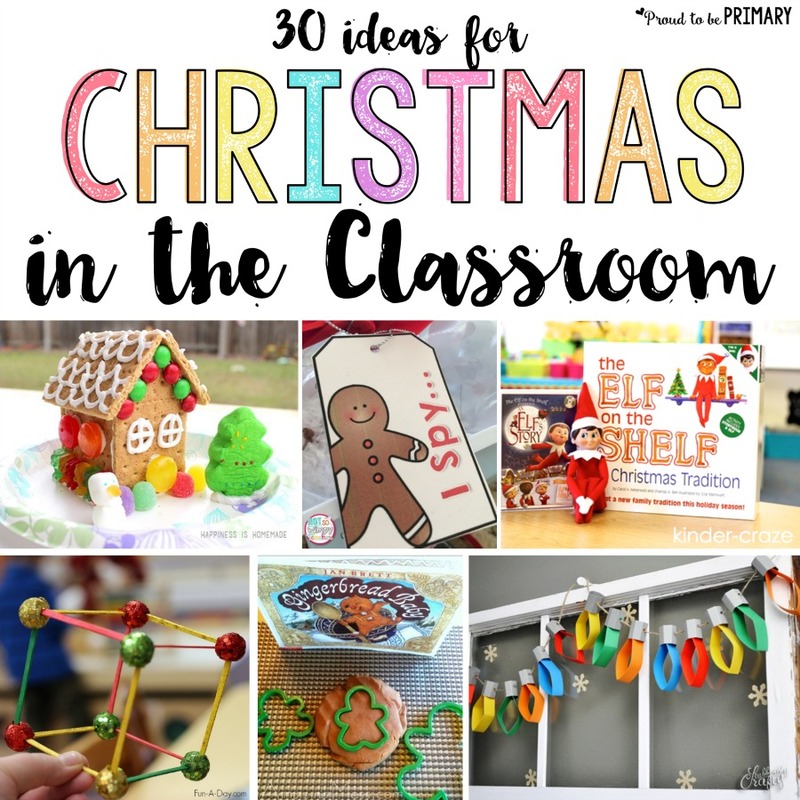 I have scoured the internet (hello Pinterest) and gathered awesome ideas from my teacher/blogger friends to bring you the best ways that we can share Christmas and the holidays in the classroom. 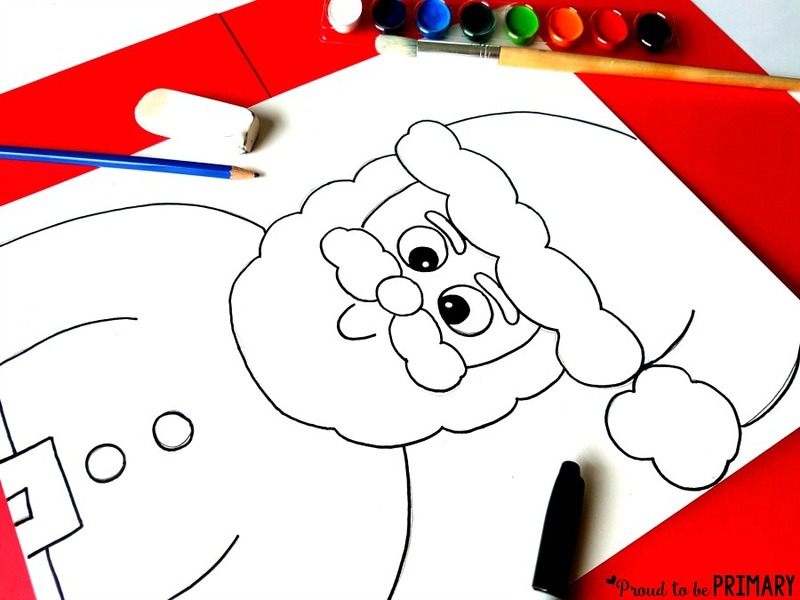 You will find a collection of activities, arts & crafts, DIY decorations, books, freebies, and more. 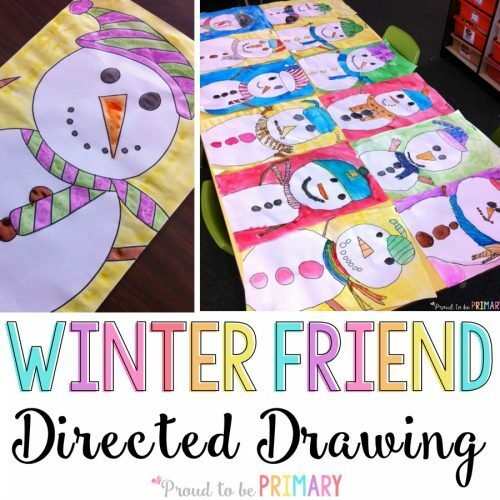 Each idea is linked to the original post where you can find more details and instructions on how to use in your classroom. Happy Holidays! 1.Make these Christmas tree pine cones from smART Class with paint, plaster, and sparkly craft supplies. 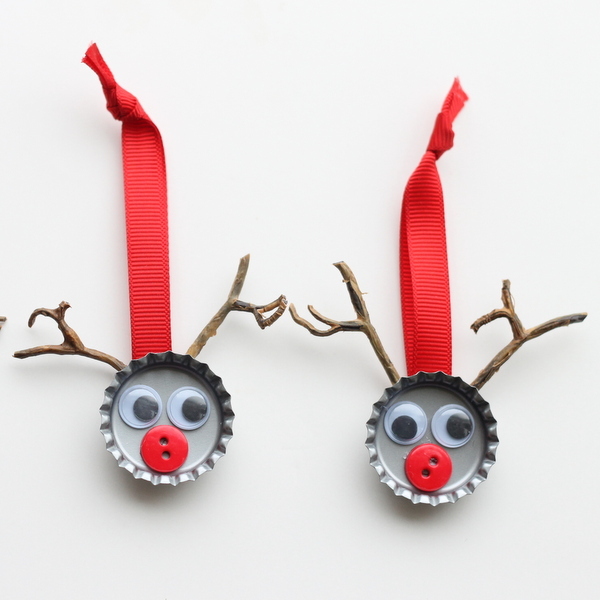 Turn them into ornaments to hang on your classroom tree. 2.The simple gingerbread house tutorial from Crafts by Amanda will help you create a recycled village of gingerbread houses in your classroom. 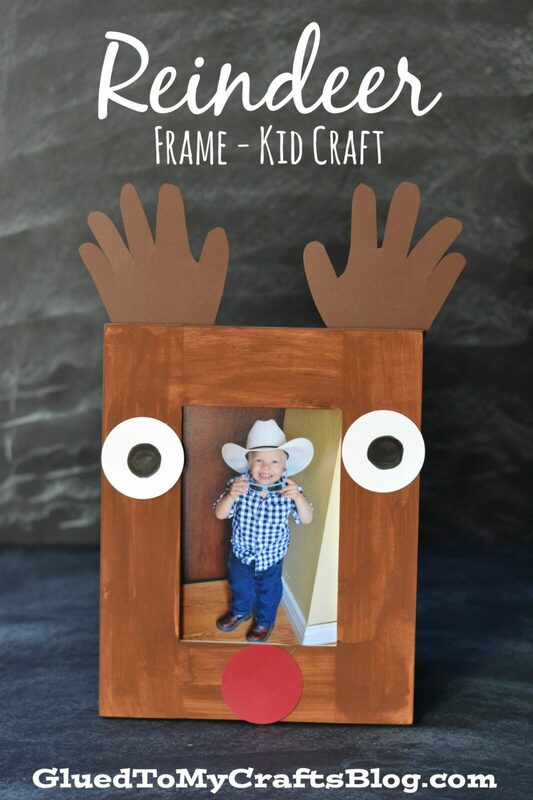 3.First and Kinder Blue Skies has the cutest crafts for all holidays and celebrations! 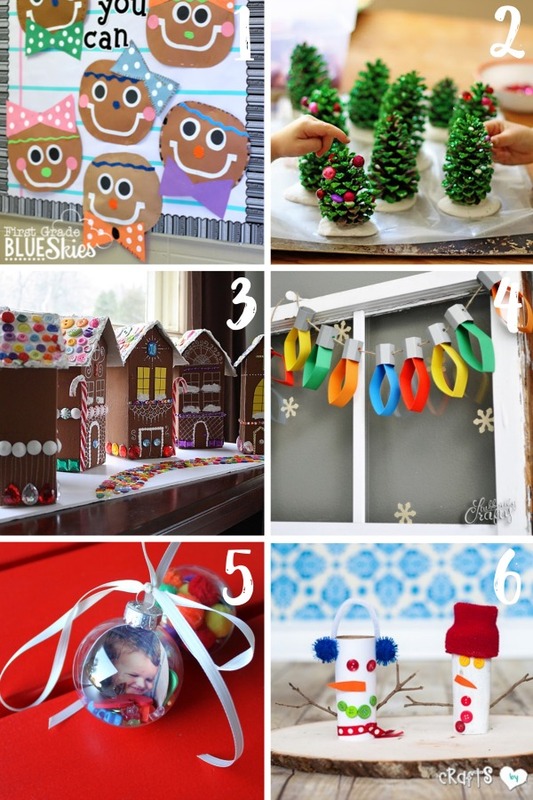 Check out her gingerbread man and elf crafts. 4. 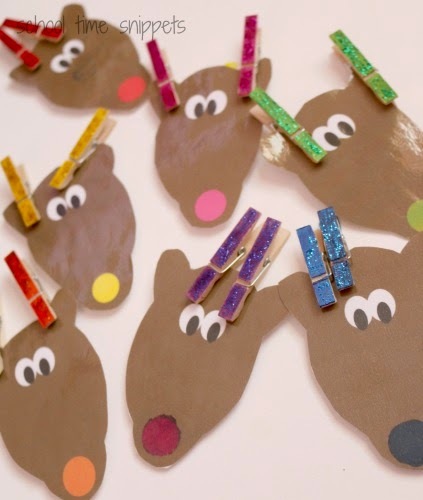 A different spin on the usual paper loop garland, is this paper Christmas lights garland from Stubbornly Crafty. This would look great hanging up around any classroom. 5. 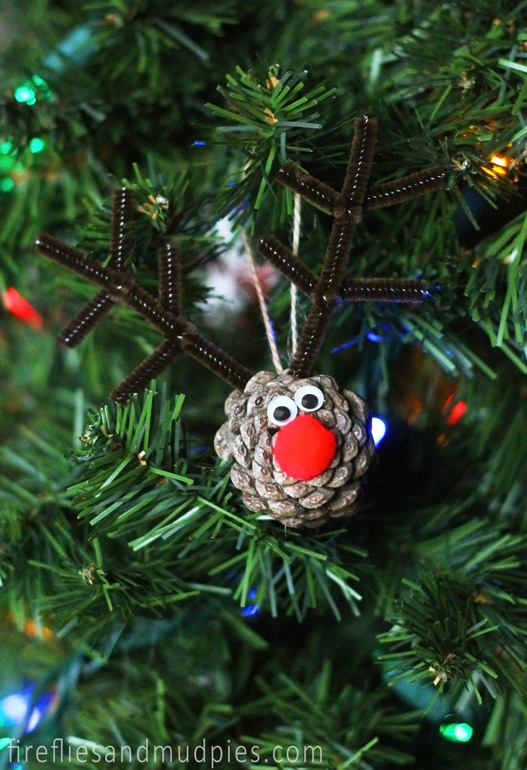 Create a special keepsake for the Christmas tree with these DIY time capsule ornaments. 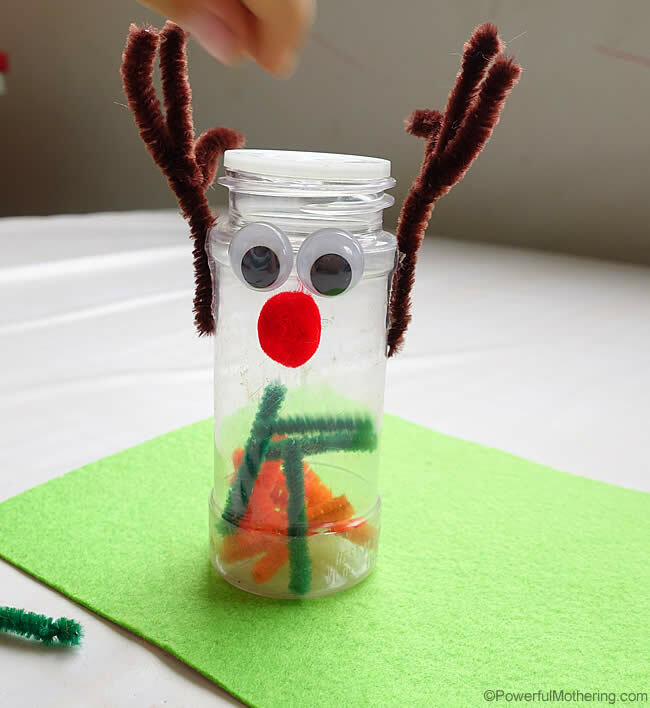 Kids will love adding their own special items inside! 6. 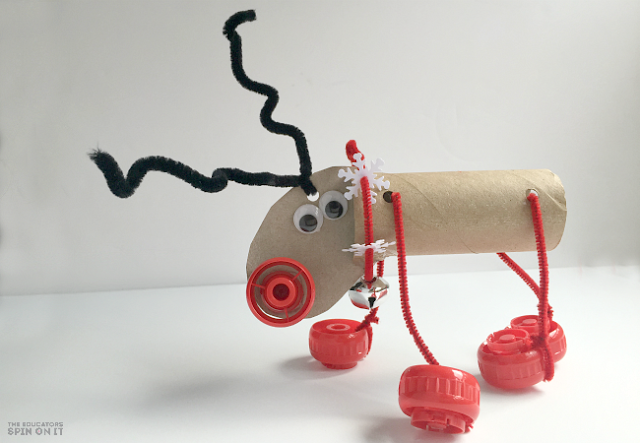 These toilet paper roll snowmen can be put together with a few simple materials. Super cute! 7. 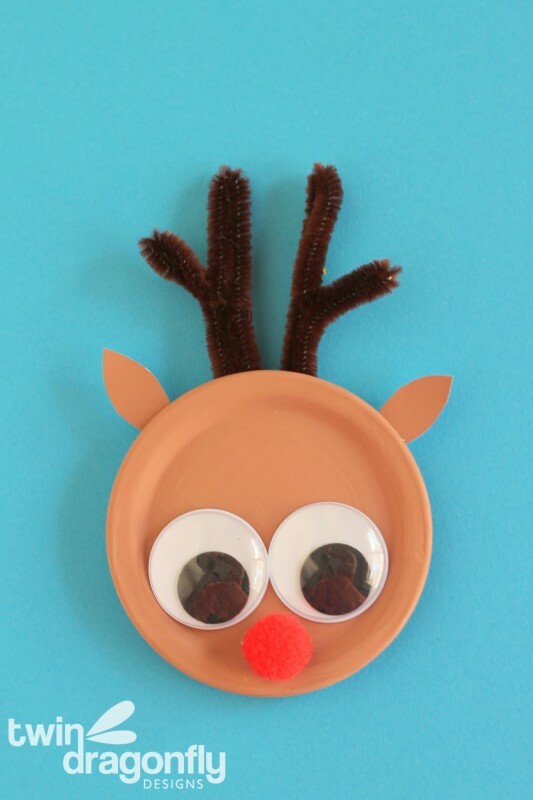 Are you hosting a holiday party for your class? 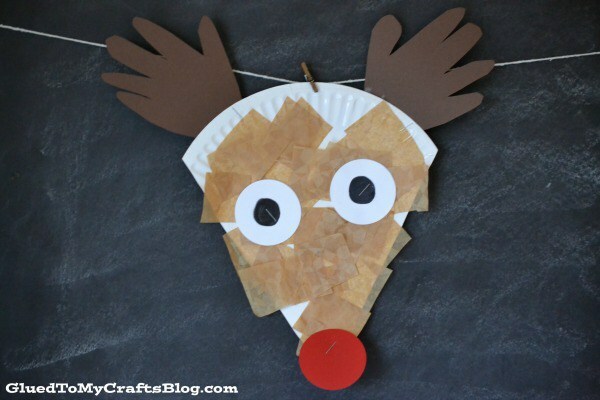 One Sharp Bunch has you covered with 8 simple holiday party ideas. 8. 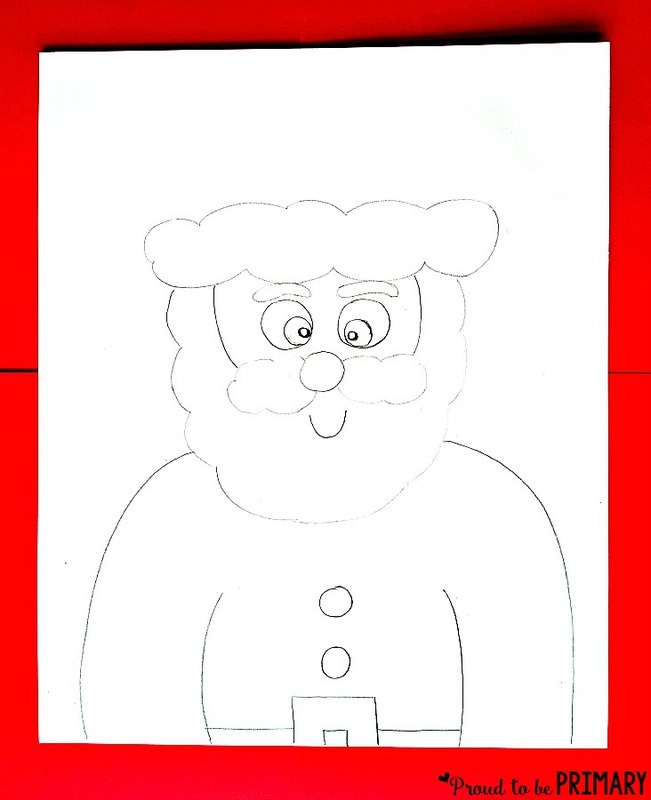 Writing letters to Santa is a great way to practice letter writing. Having a clear anchor chart filled with ideas like this one is a must. 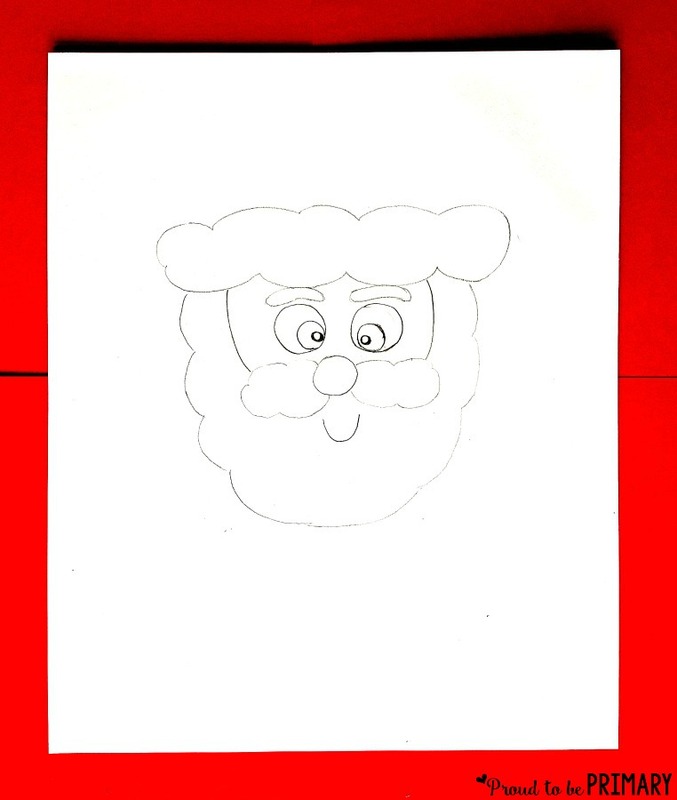 Of course, you’ll also need this free Santa stationary from It’s a Fabulous Life! 9. 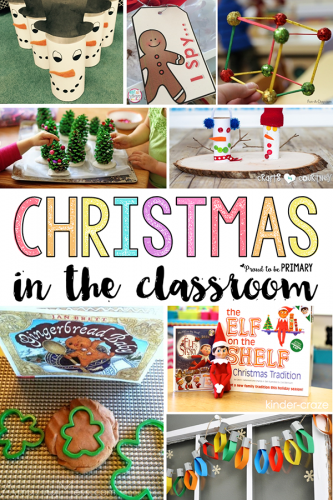 Having a Christmas book exchange in the classroom is a fantastic idea! 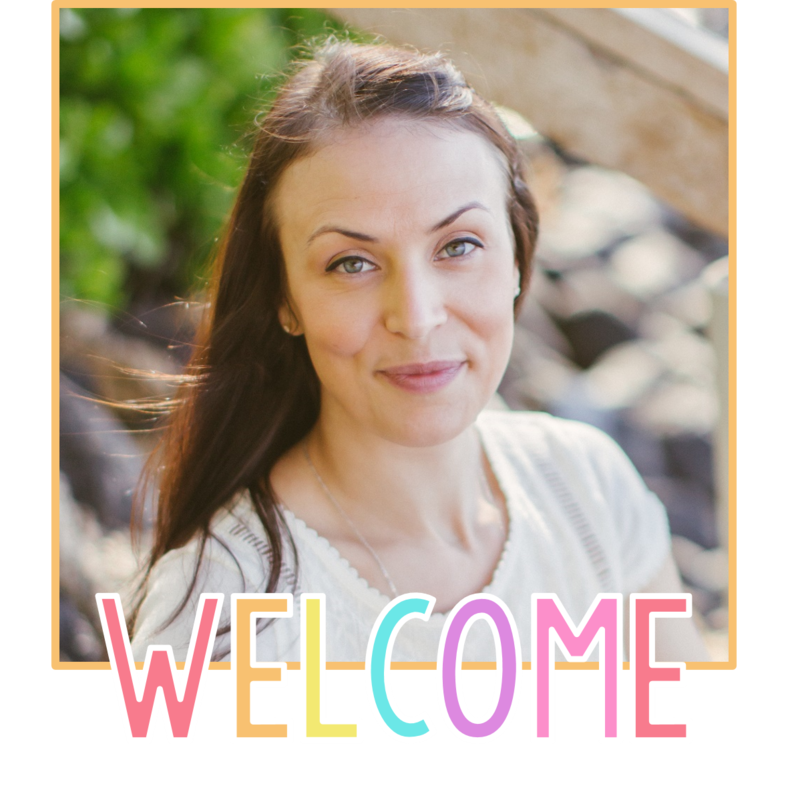 Books and Giggles shares their tips on hosting one in your classroom. 10. STEM activities are the perfect thing to help with that extra excitement and energy that’s floating around. 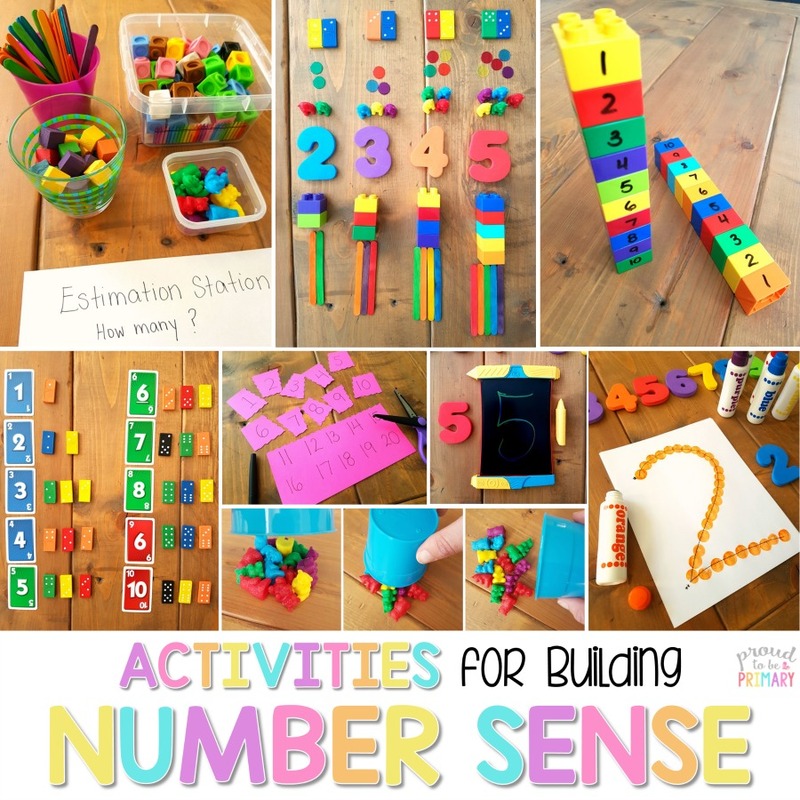 This engineering activity from Fun-a-Day is sure to please! 11. 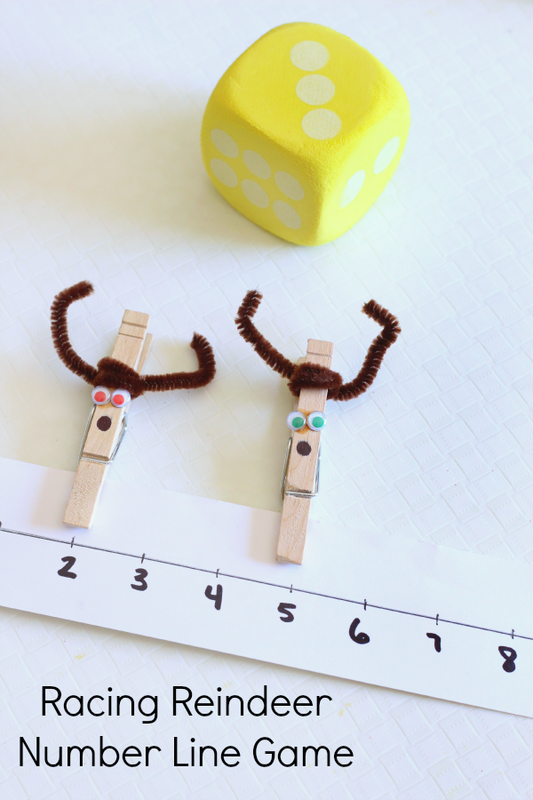 Create an advent calendar with daily STEM challenges like the one seen in this post. 12. 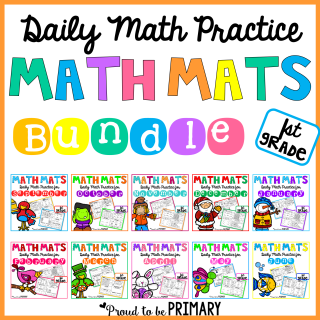 Make patterns in math with these hands-on activities by A Day in First Grade. 13. Children love making editable gingerbread houses and Happiness is Homemade makes it look so easy with graham crackers! 14. 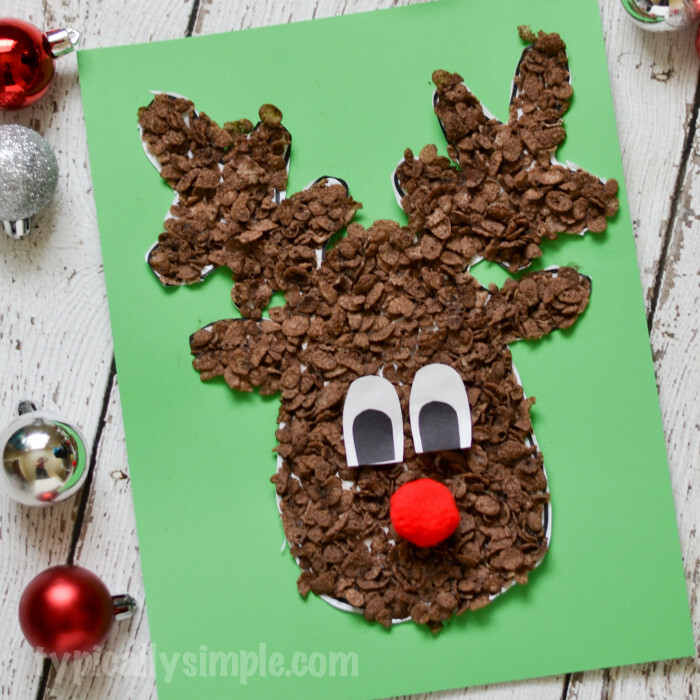 This Rudolph applesauce treat is healthy and so simple to whip up as a gift. 15. Bake at 350 has a simple way of decorating cookies with kids. 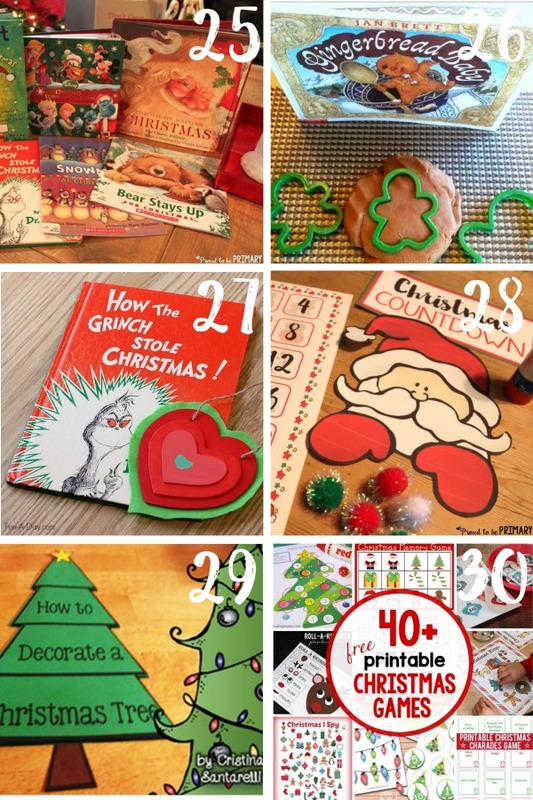 Check out her post and tips to make icing those Christmas cookies a fun experience for all! 16. 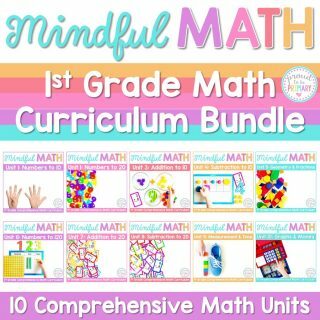 Looking simple holiday gift ideas for your students? 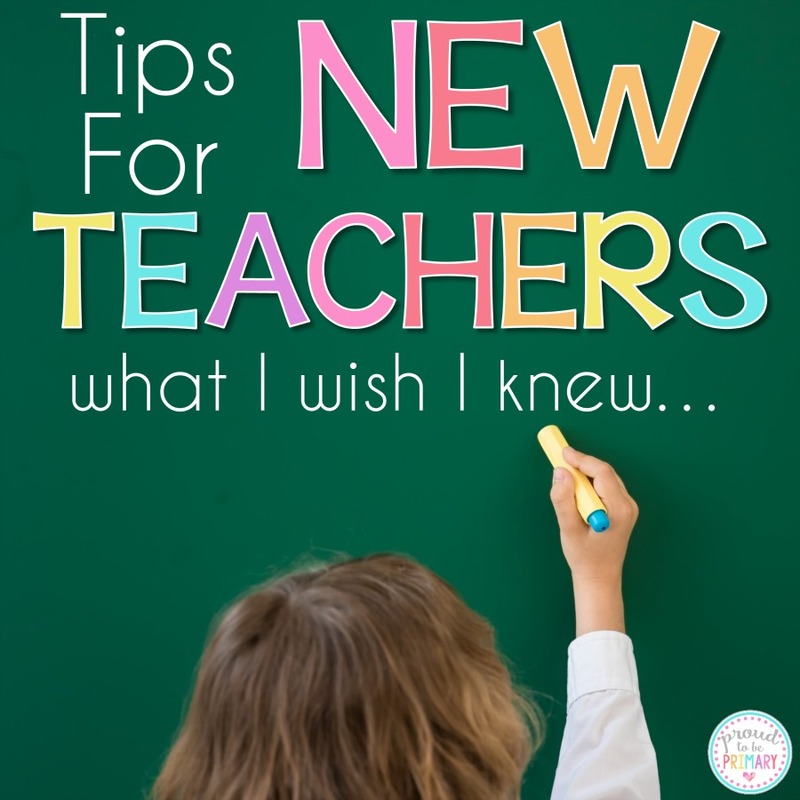 Check out these 5 creative ideas from Diary of a Not So Wimpy Teacher. 17. 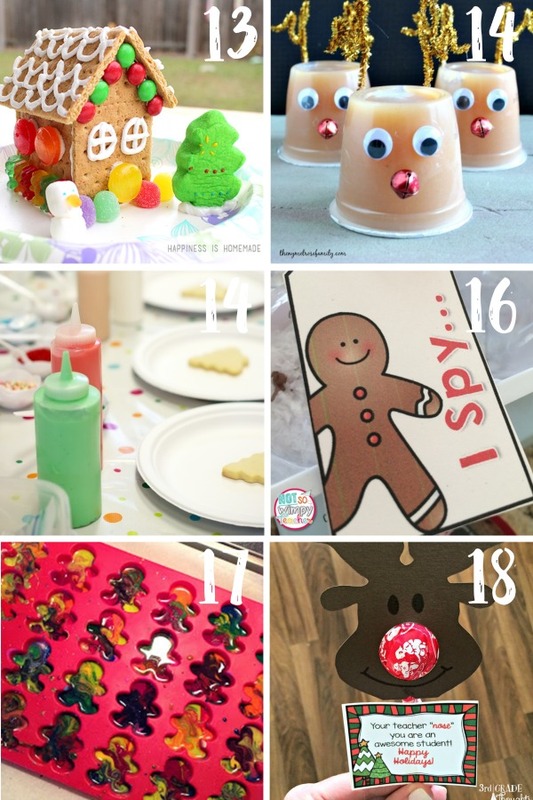 These gingerbread man DIY crayons are a great way to use up those broken crayons you have laying around the class. 18. 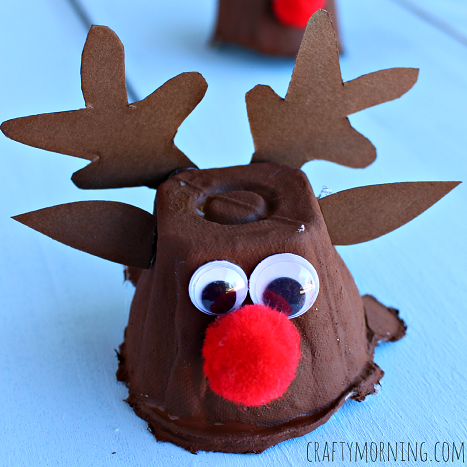 Create Rudolph lollipops as a simple, low-cost treat for kids. 19. Maria from Kinder Craze has a great elf on the shelf post where she details how she sets-up for, introduces, and finds the perfect spot for the elf. 20. 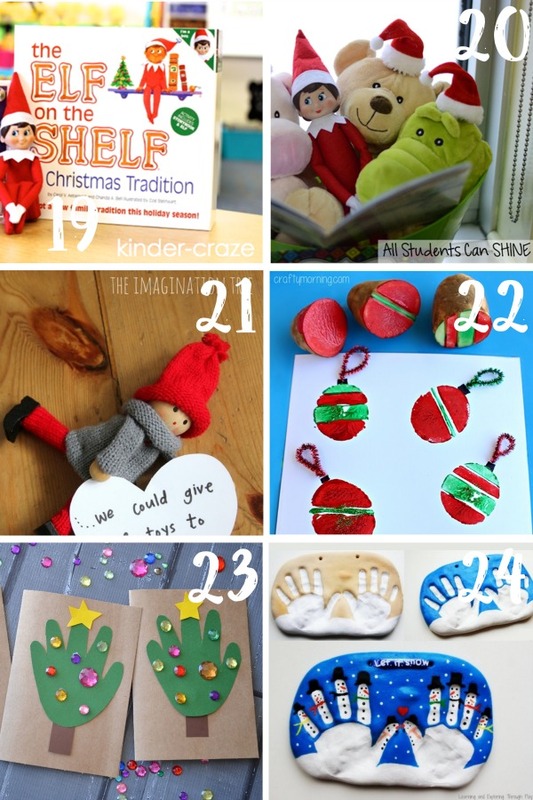 Grab more fun elf on the shelf ideas for the classroom from All Students Can Shine. Love the elf in the basket with the reading buddies! 21. Love the idea of kindness elves as an alternative to elf on the shelf. The Imagination Tree has fantastic ideas of how this can be implemented in the classroom. 22. 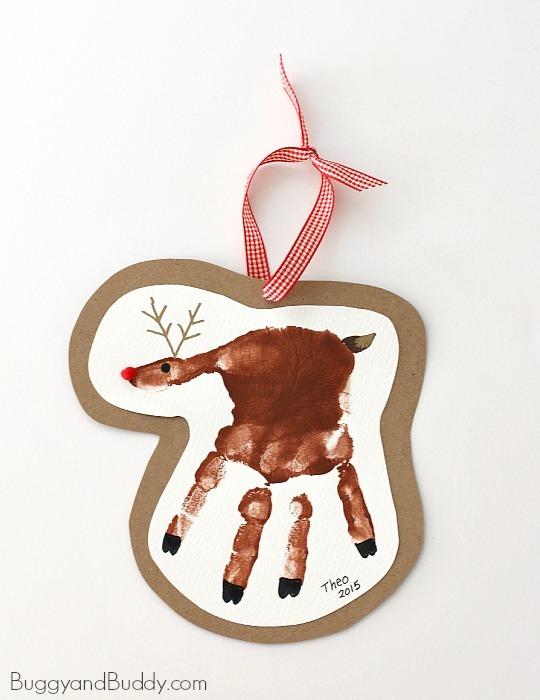 Crafty Morning’s idea of using potatoes stamps in paint to make ornaments to decorate Christmas cards is a fun one. 23. 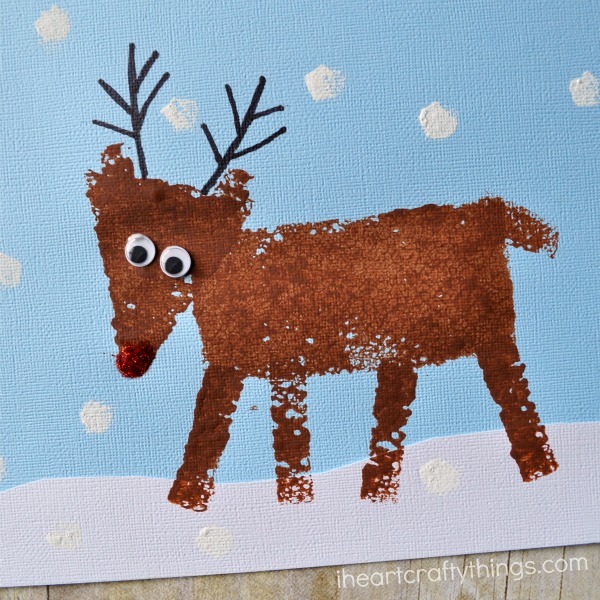 Make these unique handprint Christmas cards from Blitsy for a perfect keepsake! 24. 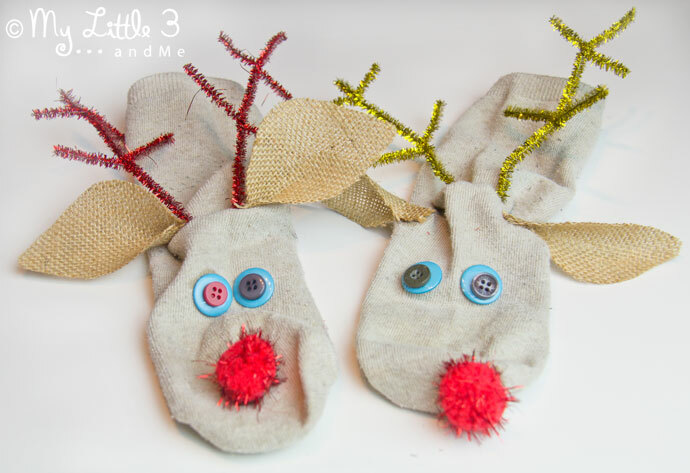 Nothing beats using a child’s feet and hands to make the perfect Christmas card and gift. 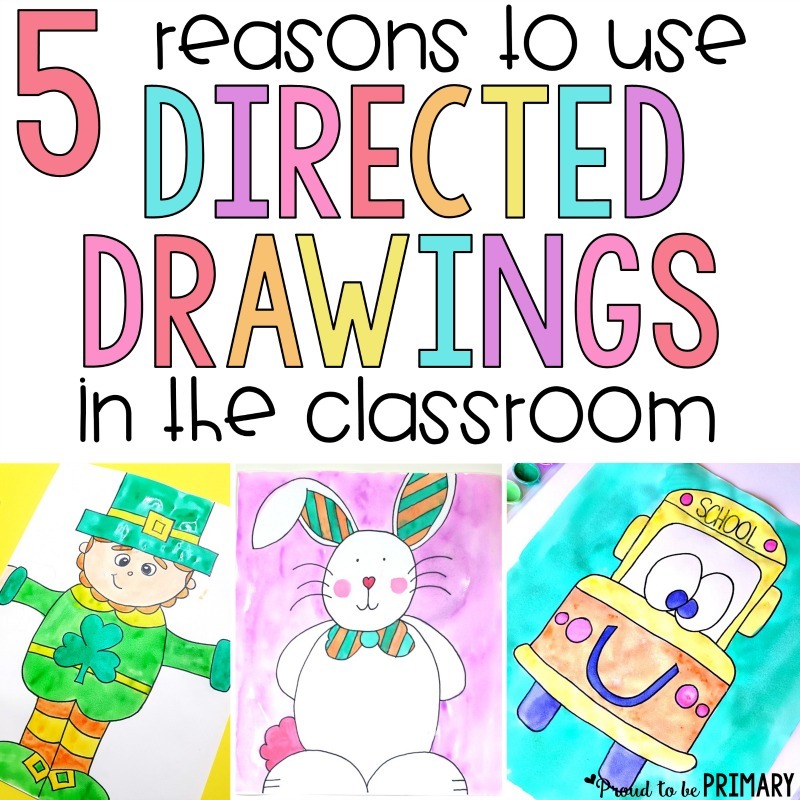 Check out these ideas! 25. 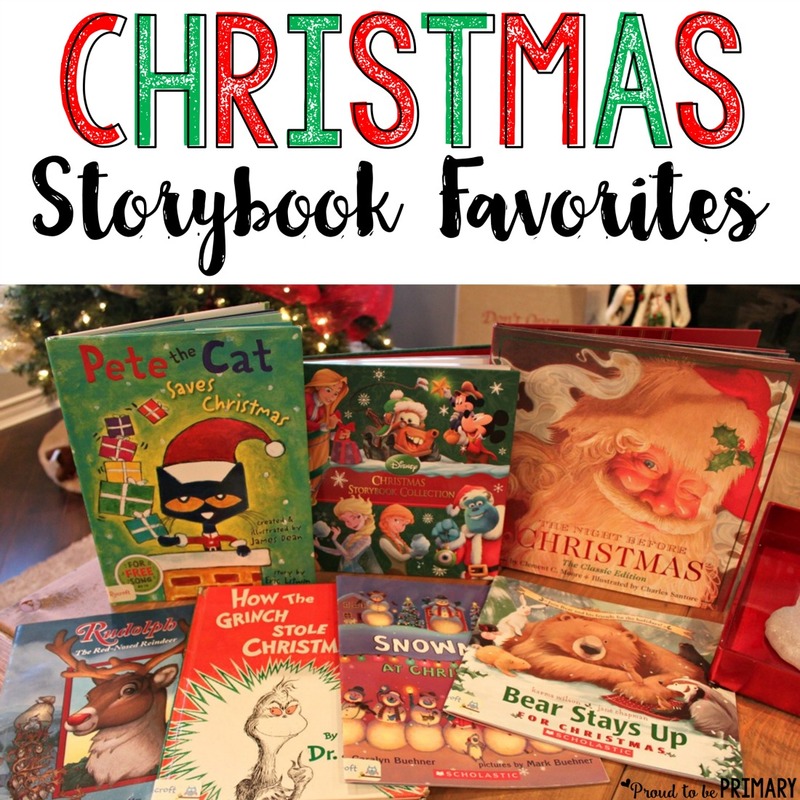 Here is a list of Christmas storybooks that are perfect for December read alouds. Which is your favourite? 26. 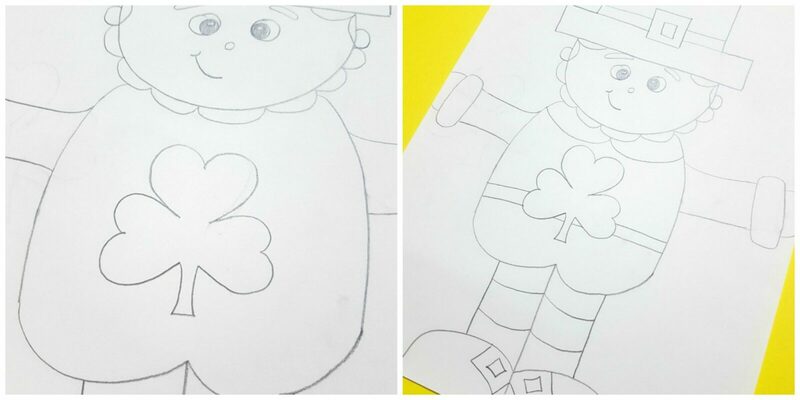 Children love books about a gingerbread man! 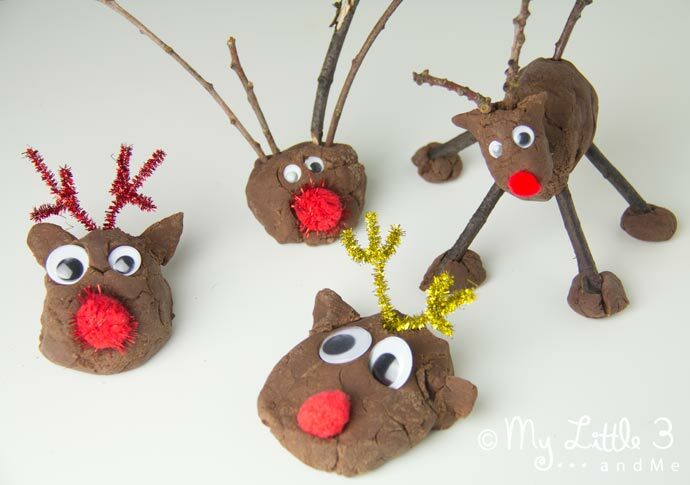 Read The Gingerbread Boy and make gingerbread playdough with this recipe from Amazing Mess. 27. 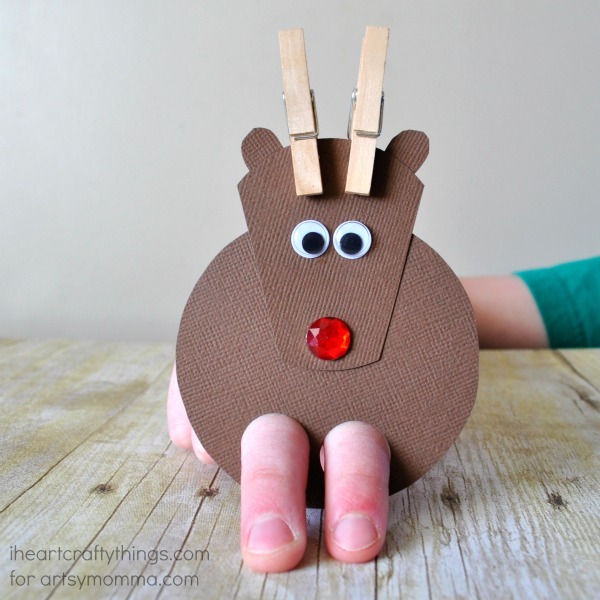 Make a growing heart like the Grinch’s heart with this Christmas ornament idea from Fun-A-Day. 28. 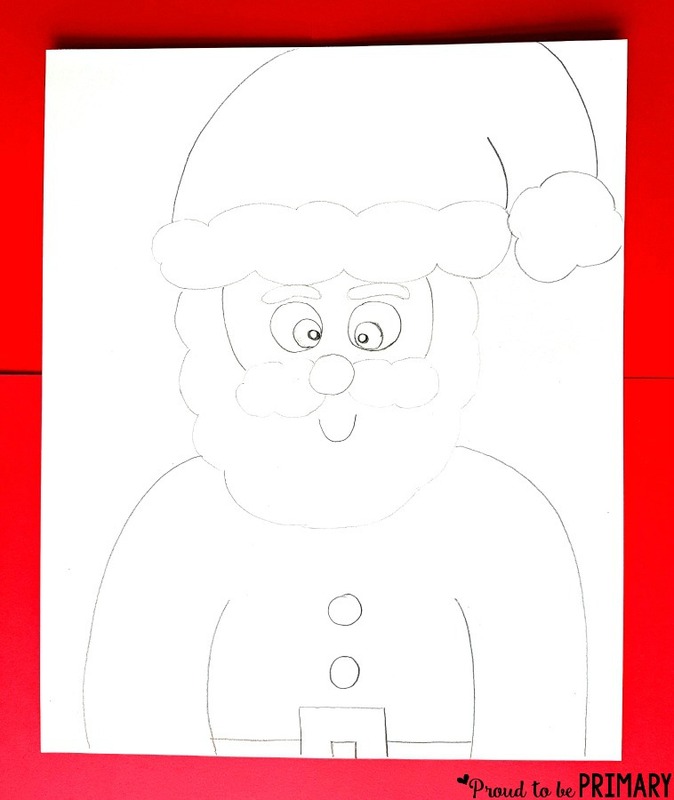 Countdown the days until Christmas with this free printable. 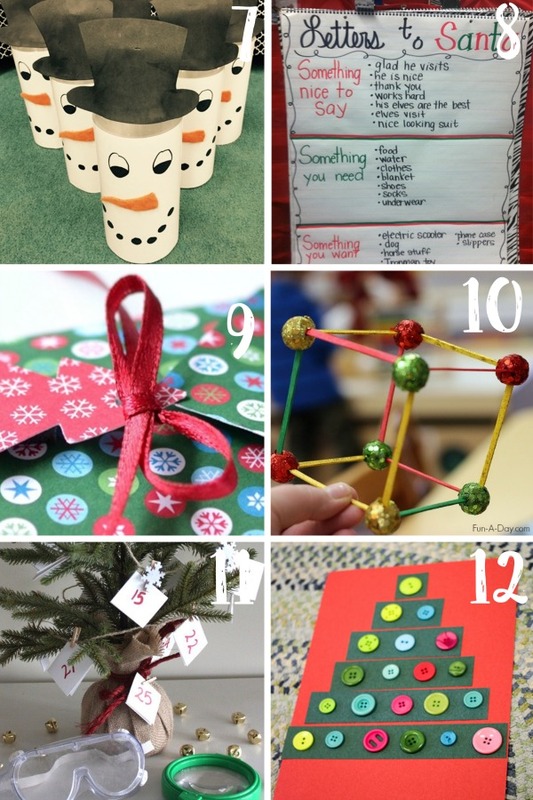 Each kid can make their own Christmas Holiday Countdown to take home during winter break. 29. 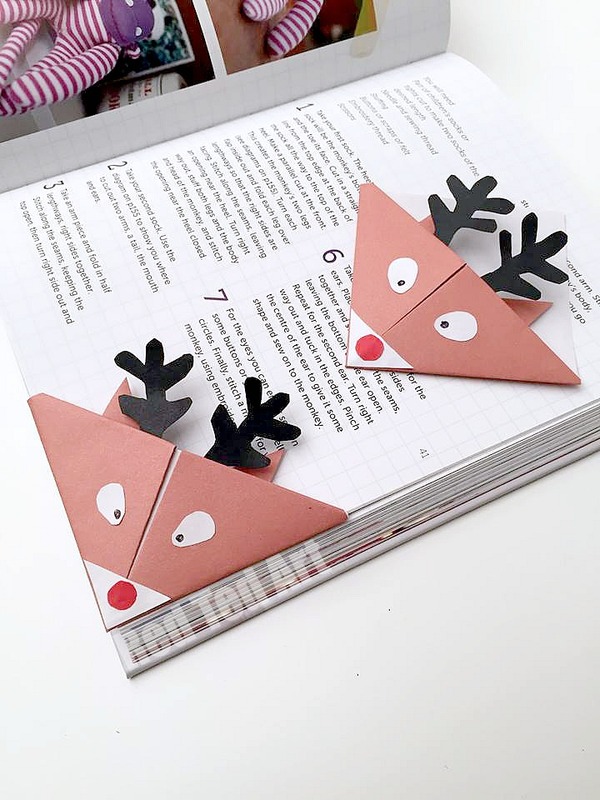 This Christmas tree foldable is a great way to include how-to writing practice in December. 30. Here are 40+ FREE Christmas games for readers to download and use right away!